"Lebron" redirects here. For other people with the name, see Lebrón (name). 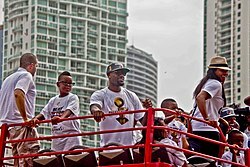 For his son, see LeBron James Jr.
James won his first two NBA championships while playing for the Miami Heat in 2012 and 2013. He was named league MVP and NBA Finals MVP in both championship years. After his fourth season with the Heat in 2014, James opted out of his contract to re-sign with the Cavaliers. In 2016, he led the Cavaliers to victory over the Golden State Warriors in the NBA Finals, delivering the team's first championship and ending Cleveland's 52-year professional sports title drought. James's teams appeared in the NBA Finals in eight consecutive seasons (from 2011 to 2018). In 2018, James opted out of his contract with the Cavaliers to sign with the Lakers. James started playing organized basketball in the fifth grade. He later played Amateur Athletic Union (AAU) basketball for the Northeast Ohio Shooting Stars. The team enjoyed success on a local and national level, led by James and his friends Sian Cotton, Dru Joyce III, and Willie McGee. :24 The group dubbed themselves the "Fab Four" and promised each other that they would attend high school together. :27 In a move that stirred local controversy, they chose to attend St. Vincent–St. Mary High School, a private Catholic school with predominantly white students. As a freshman, James averaged 21 points and 6 rebounds per game for the St. Vincent-St. Mary varsity basketball team. The Fighting Irish went 27–0 en route to the Division III state title, making them the only boys high school team in Ohio to finish the season undefeated. As a sophomore, James averaged 25.2 points and 7.2 rebounds with 5.8 assists and 3.8 steals per game. For some home games during the season, St. Vincent-St. Mary played at the University of Akron's 5,492-seat Rhodes Arena to satisfy ticket demand from alumni, fans, and college and NBA scouts who wanted to see James play. The Fighting Irish finished the season 26–1 and repeated as state champions. For his outstanding play, James was named Ohio Mr. Basketball and selected to the USA Today All-USA First Team, becoming the first sophomore to do either. Prior to the start of his junior year, James was featured in Slam, an American basketball magazine, and writer Ryan Jones lauded him as possibly "the best high school basketball player in America right now". During the season, he appeared on the cover of Sports Illustrated, becoming the first high school basketball underclassman to do so. :104 With averages of 29 points, 8.3 rebounds, 5.7 assists, and 3.3 steals per game, he was again named Ohio Mr. Basketball and selected to the USA Today All-USA First Team, and became the first junior to be named male basketball Gatorade National Player of the Year. :117 St. Vincent-St. Mary finished the year with a 23–4 record, ending their season with a loss in the Division II championship game. :114 Following the loss, James unsuccessfully petitioned for a change to the NBA's draft eligibility rules in an attempt to enter the 2002 NBA draft. During this time, he used marijuana, which he said was to help cope with the stress that resulted from the constant media attention he was receiving. Throughout his senior year, James and the Fighting Irish traveled around the country to play a number of nationally ranked teams, including a game against Oak Hill Academy that was nationally televised on ESPN2. :142 Time Warner Cable, looking to capitalize on James's popularity, offered St. Vincent-St. Mary's games to subscribers on a pay-per-view basis throughout the season. :143 For the year, James averaged 31.6 points, 9.6 rebounds, 4.6 assists, and 3.4 steals per game, was named Ohio Mr. Basketball and selected to the USA Today All-USA First Team for an unprecedented third consecutive year,:178 and was named Gatorade National Player of the Year for the second consecutive year. He participated in three year-end high school basketball all-star games—the EA Sports Roundball Classic, the Jordan Capital Classic, and the McDonald's All-American Game—losing his National Collegiate Athletic Association (NCAA) eligibility and making it official that he would enter the 2003 NBA draft. Also during his senior year, James was the centerpiece of several controversies. For his 18th birthday, he skirted state amateur bylaws by accepting a Hummer H2 as a gift from his mother, who had secured a loan for the vehicle by utilizing James's future earning power as an NBA superstar. This prompted an investigation by the Ohio High School Athletic Association (OHSAA) because its guidelines stated that no amateur may accept any gift valued over $100 as a reward for athletic performance. James was cleared of any wrongdoing because he had accepted the luxury vehicle from a family member and not from an agent or any outside source. Later in the season, James accepted two throwback jerseys worth $845 from an urban clothing store in exchange for posing for pictures, officially violating OHSAA rules and resulting in him being stripped of his high school sports eligibility. James appealed the ruling and his penalty was eventually dropped to a two-game suspension, allowing him to play the remainder of the year. The Irish were also forced to forfeit one of their wins, their only official loss that season. In his first game back after the suspension, James scored a career-high 52 points. St. Vincent-St. Mary went on to win the Division II championship, marking their third division title in four years. In his rookie season, James was selected by his hometown team, the Cleveland Cavaliers, as the first overall pick of the 2003 NBA draft. In his first regular season game, he scored 25 points against the Sacramento Kings, setting an NBA record for most points scored by a prep-to-pro player in his debut performance. At the conclusion of the season, he was named the NBA Rookie of the Year, finishing with averages of 20.9 points, 5.5 rebounds, and 5.9 assists per game. He became the first player of the Cavaliers to receive the honor and just the third player in NBA history to average at least 20 points, 5 rebounds, and 5 assists per game as a rookie. The Cavaliers finished the season 35–47, failing to make the playoffs despite an 18-game improvement over the previous year. James earned his first NBA All-Star Game selection in 2004–05, contributing 13 points, 8 rebounds, and 6 assists in a winning effort for the Eastern Conference. Around the league, teams took note of his rapid development, with Denver Nuggets coach George Karl telling Sports Illustrated, "It's weird talking about a 20-year-old kid being a great player, but he is a great player ... He's the exception to almost every rule." On March 20, James scored 56 points against the Toronto Raptors, setting Cleveland's new single-game points record. With final averages of 27.2 points, 7.4 rebounds, 7.2 assists, and 2.2 steals per game, he was named to his first All-NBA Team. Despite a 30–20 record to start the year, the Cavaliers again failed to make the playoffs, finishing the season 42–40. At the 2006 All-Star Game, James led the East to victory with 29 points and was named the NBA All-Star Game Most Valuable Player. Behind final season averages of 31.4 points, 7 rebounds, and 6.6 assists per game, he also finished second in overall NBA Most Valuable Player Award voting to Steve Nash. Under James's leadership, the Cavaliers qualified for the playoffs for the first time since 1998. In his postseason debut, James recorded a triple-double in a winning effort versus the Washington Wizards. In Game 3 of the series, he made the first game-winning shot of his career, making another in Game 5. Cleveland would go on to defeat the Wizards before being ousted by the Detroit Pistons in the second round. In 2006–07, James's averages declined to 27.3 points, 6.7 rebounds, 6 assists, and 1.6 steals per game. Some analysts attributed the fall to a regression in his passing skills and shot selection, which stemmed from a lack of effort and focus. The Cavaliers finished the season with 50 wins for the second consecutive year and entered the playoffs as the East's second seed. In Game 5 of the NBA Conference Finals, James notched 48 points with 9 rebounds and 7 assists, scoring 29 of Cleveland's last 30 points, including the game-winning layup with two seconds left, against the Pistons. After the game, play-by-play announcer Marv Albert called the performance "one of the greatest moments in postseason history" and color commentator Steve Kerr described it as "Jordan-esque". In 2012, ESPN ranked the performance the fourth greatest in modern NBA playoff history. The Cavaliers went on to win Game 6 and claim their first-ever Eastern Conference championship, earning them a matchup with the San Antonio Spurs in the NBA Finals. During the championship round, James struggled, averaging 22 points, 7.0 rebounds, and 6.8 assists per game on just 35.6 percent shooting, and Cleveland was eliminated in a sweep. In February of the 2007–08 season, James was named All-Star Game MVP for the second time behind a 27-point, 8-rebound, and 9-assist performance. On March 21, he moved past Brad Daugherty as the Cavaliers' all-time leading scorer in a game against the Raptors, doing so in over 100 less games than Daugherty. His 30 points per game were also the highest in the league, representing his first scoring title. Despite his individual accomplishments, Cleveland's record fell from the year before to 45–37. Seeded fourth in the East entering the playoffs, the Cavaliers defeated the Wizards in the first round for the third consecutive season before being eliminated in seven games by the eventual-champion Boston Celtics in the next round. During the decisive seventh game in Boston, James scored 45 points and Paul Pierce scored 41 in a game the Associated Press described as a "shootout". 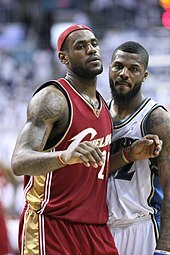 James and DeShawn Stevenson in April 2008, The two had a short feud after Stevenson called James "overrated"
At the conclusion of the 2008–09 season, James finished second in NBA Defensive Player of the Year Award voting and made his first NBA All-Defensive Team, posting 23 chase-down blocks and a career-high 93 total blocks. He also became only the fourth postmerger player to lead his team in points, rebounds, assists, steals, and blocks in a single season. Behind his play and the acquisition of All-Star guard Mo Williams, Cleveland went a franchise record 66–16 and fell just one game short of matching the best home record in league history. With final averages of 28.4 points, 7.6 rebounds, 7.2 assists, 1.7 steals, and 1.2 blocks per game, James became the first Cavalier to win the MVP Award. Reflecting on James's performance for ESPN, John Hollinger later wrote, "He's having what is arguably the greatest individual season in history, and it's time we gave him his due for it." In the playoffs, Cleveland swept the Pistons and the Atlanta Hawks to earn a matchup with the Orlando Magic in the Conference Finals. In Game 1 of the series, James scored 49 points on 66 percent shooting in a losing effort for the Cavaliers. In Game 2, he hit a game-winner to tie the series at 1–1. Cleveland would lose the series in six games, and following the loss in Game 6, James immediately left the floor without shaking hands with his opponents, which was an act that many media members viewed as unsportsmanlike. For the series, he averaged 38.5 points, 8.3 rebounds, and 8 assists per game, finishing the postseason with a career playoff-high 35.3 points per game. In February of the 2009–10 season, James was forced into a temporary point guard role following a series of injuries to players in the Cavaliers' backcourt. Behind his leadership, Cleveland lost no momentum, finishing the year with the best record in the league for the second consecutive season. Due in part to his increased minutes as the Cavaliers' primary ball handler, James increased his statistical production, averaging 29.7 points, 7.3 rebounds, 8.6 assists, 1.6 steals, and 1 block per game on 50 percent shooting en route to another MVP Award. To open the playoffs, Cleveland advanced past the Bulls to earn a matchup with the Celtics in the second round. James was heavily criticized for not playing well in Game 5 of the series, shooting only 20 percent on 14 shots and scoring 15 points. The team suffered its worst loss in franchise history, and at the conclusion of the game, James walked off the court to a smattering of boos from Cleveland's home crowd. The Cavaliers were officially eliminated from the postseason in Game 6, with James posting 27 points, 19 rebounds, 10 assists, and nine turnovers in the losing effort. James with the Cavaliers in November 2009. He finished his first stint with the Cavs averaging 27.8 points, 7 rebounds, 7 assists, and 1.7 steals per game. James became an unrestricted free agent at 12:01 am EDT on July 1, 2010. During this time, he was contacted by several teams, including the Bulls, Los Angeles Clippers, Miami Heat, New York Knicks, New Jersey Nets, and Cavaliers. On July 8, he announced on a live ESPN special titled The Decision that he would sign with the Heat. The telecast was broadcast from the Boys & Girls Club of Greenwich, Connecticut and raised $2.5 million for the charity. An additional $3.5 million was raised from advertising revenue, which was donated to other charities. The day before the special, fellow free agents Chris Bosh and Dwyane Wade also announced that they would sign with Miami; reports later arose that back in 2006 the trio had discussed among themselves their upcoming 2010 free agencies. James decided to join with Bosh and Wade in part so that he could shoulder less of the offensive load; he thought that his improved teammates would give him a better chance of winning an NBA championship than had he stayed in Cleveland. Heat president Pat Riley played a major role in selling James on the idea of playing with Bosh and Wade. James would be relieved of the burden of scoring, and he thought he could be the first player since Oscar Robertson to average a triple-double in a season. Upon leaving the Cavaliers, James drew intense criticism from sports analysts, executives, fans, and current and former players. The Decision itself was also scrutinized and viewed as unnecessary. Many thought that the prolonged wait for James's choice was unprofessional as not even the teams courting him were aware of his decision until moments before the show. Upon learning that James would not be returning to Cleveland, Cavaliers owner Dan Gilbert published an open letter to fans in which he aggressively denounced James's actions. Some angry fans of the team recorded videos of themselves burning his jersey. Former NBA players, including Michael Jordan and Magic Johnson, were also critical of James, condemning him for joining with Bosh and Wade in Miami and not trying to win a championship as "the man". James drew further criticism in a September interview with CNN when he claimed that race might have been a factor in the fallout from The Decision. As a result of his actions during the 2010 free agency period, he quickly gained a reputation as one of America's most disliked athletes, which was a radical change from prior years. The phrase "taking my talents to South Beach" became a punch line for critics. In retrospect, James has expressed some regret over his handling of The Decision. James officially signed with the Heat on July 10, 2010. With the move, he became only the third reigning MVP to change teams and the first since Moses Malone in 1982. That evening, the Heat threw a welcome party for their new "big three" at the American Airlines Arena, an event that took on a rock concert atmosphere. During the gathering, James predicted a dynasty for the Heat and alluded to multiple championships. Outside of Miami, the spectacle was not well-received, furthering the negative public perception of James. 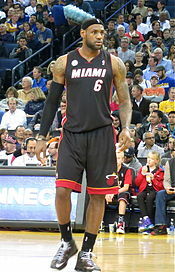 Throughout the 2010–11 season, the media and opposing fanbases treated James and the Heat as villains. To begin the year, they struggled to adjust to these new circumstances, going only 9–8 after 17 games. James later admitted that the constant negativity surrounding the team made him play with an angrier demeanor than in years past. On December 2, James faced the Cavaliers in Cleveland for the first time since departing as a free agent. He scored 38 points and led Miami to a win while being booed every time he touched the ball. The Heat eventually turned their season around and finished as the East's second seed, with James averaging 26.7 points, 7.5 rebounds, and 7 assists per game on 51 percent shooting. In the conference semifinals, James and his teammates found themselves matched up with the Celtics for the second consecutive year. In Game 5, he scored Miami's last ten points to help seal a series-clinching win. After the final buzzer, he famously knelt on the court in an emotional moment, later telling reporters that it was an extremely personal victory for him and the team. The Heat eventually advanced to the Finals, where they were defeated by the Dallas Mavericks in six games. James received the brunt of the criticism for the loss, averaging only three points in fourth quarters in the series. His Finals scoring average of 17.8 points per game signified an 8.9-point drop from the regular season, the largest point drop-off in league history. James was humbled by the Heat's loss to the Mavericks, and the experience inspired him to leave behind the villain role that he had been embracing, which helped him regain a sense of joy on the court. He also decided that his post game needed improvement, so he worked with Hakeem Olajuwon during the offseason. Behind James's significantly-expanded skillset, Miami began the year with a franchise-best 18–6 record. He was eventually named MVP for the third time, finishing with averages of 27.1 points, 7.9 rebounds, 6.2 assists, and 1.9 steals per game on 53 percent shooting. James stands at midcourt during a dead ball in January 2013. On that night, he became the youngest player in NBA history to score 20,000 career points. In the second round of the playoffs, Miami temporarily lost Chris Bosh to an abdominal injury and found themselves trailing the Indiana Pacers 2–1. James responded with a 40-point, 18-rebound, and 9-assist outing in Game 4 to help even the series. To compensate for Bosh's absence, the Heat embraced a small-ball lineup with James at power forward, which they retained even after Bosh's return in the Conference Finals against the Celtics. Facing elimination in Game 6, James recorded 45 points and 15 rebounds to lead the Heat to victory in what The New York Times called a "career-defining performance". Miami won Game 7 to advance to the Finals, earning them a matchup with the Oklahoma City Thunder and James's budding rival, Kevin Durant. Late in Game 4 of the series, James hit a three-pointer to give the Heat a lead, helping them win the game despite missing time with leg cramps. In Game 5, he registered a triple-double as Miami defeated Oklahoma City for their second-ever championship and James's first championship. James was unanimously voted the Bill Russell NBA Finals Most Valuable Player with averages of 28.6 points, 10.2 rebounds, and 7.4 assists per game. His full postseason run, in which he averaged 30.3 points, 9.7 rebounds, and 5.6 assists per game, was later ranked the second best in modern NBA history by ESPN. In February of the 2012–13 season, James averaged 29.7 points and 7.8 assists per game while setting multiple shooting efficiency records. That same month, the Heat also began a 27-game winning streak, the third longest in NBA history. Based on these accomplishments, James's performance was described as a "month for the ages" by Sports Illustrated. Miami eventually finished the year with a franchise and league best 66–16 record, and James was named MVP for the fourth time, falling just one vote shy of becoming the first player in NBA history to win the award unanimously. His final season averages were 26.8 points, 8 rebounds, 7.3 assists, and 1.7 steals per game on 56.5 percent shooting. In Game 1 of the Conference Finals, James scored a buzzer-beating layup to give Miami a one-point victory against the Pacers. Throughout the series, his supporting cast struggled significantly, and his added scoring load prompted him to compare his responsibilities to those of his "Cleveland days". Despite these struggles, the Heat advanced to the Finals for a meeting with the Spurs, signifying a rematch for James from his first Finals six years earlier. At the beginning of the series, he was criticized for his lack of aggressiveness and poor shot selection as Miami fell behind 2–3. In Game 6, he recorded his second triple-double of the series, including 16 fourth quarter points, to lead the Heat to a comeback victory. In Game 7, he tied the Finals record for most points scored in a Game 7 victory, leading Miami over San Antonio with 37 points. He was named Finals MVP for the second straight season, averaging 25.3 points, 10.9 rebounds, 7 assists, and 2.3 steals per game for the championship round. On March 3 of the 2013–14 season, James scored a career-high and franchise-record 61 points in a game against the Charlotte Bobcats. Throughout the year, he was one of the few staples for a Heat roster that used 20 different starting lineups due to injuries, finishing with averages of 27.1 points, 6.9 rebounds, and 6.4 assists per game on 56.7 percent shooting. In the second round of the playoffs, he tied a career postseason-high by scoring 49 points in Game 4 against the Brooklyn Nets. In the next round, Miami defeated the Pacers to earn their fourth consecutive Finals berth, becoming one of only four teams in NBA history to do so. In Game 1 of the Finals, James missed most of the fourth quarter because of leg cramps, helping the Spurs take an early series lead. In Game 2, he led the Heat to a series-tying victory with 35 points on a 64 percent shooting rate. San Antonio eventually eliminated the Heat in five games, ending Miami's quest for a three-peat. For the Finals, James averaged 28.2 points, 7.8 rebounds, and 2.0 steals per game. James throws a pass in a game against the Minnesota Timberwolves as Gorgui Dieng defends in December 2014. Later that season, he reached several passing milestones, including becoming the Cavaliers' all-time assists leader. On June 25, 2014, James opted out of his contract with the Heat, and on July 1, he officially became an unrestricted free agent. On July 11, he revealed via a first-person essay in Sports Illustrated that he intended to return to the Cavaliers. In contrast to The Decision, his announcement to return to Cleveland was well received. On July 12, he officially signed with the team, who had compiled a league-worst 97–215 record in the four seasons following his departure. A month after James's signing, the Cavaliers acquired Kevin Love from the Minnesota Timberwolves, forming a new star trio along with Kyrie Irving. In January of the 2014–15 season, James missed two weeks due to left knee and lower back strains, which represented the longest stretch of missed games in his career. In total, he played a career-low 69 games and his final averages were 25.3 points, 6 rebounds, and 7.4 assists per game. In the second round of the playoffs, he hit a baseline jumper at the buzzer to give Cleveland a 2–2 series tie with the Bulls. In the Conference Finals, the Cavaliers defeated the Hawks to advance to the Finals, making James the first player since the 1960s to play in five consecutive Finals. For most of the Finals against the Golden State Warriors, Irving and Love were sidelined due to injury, giving James more offensive responsibilities. Behind his leadership, the Cavaliers opened the series with a 2–1 lead before being eliminated in six games. Despite the loss, he received serious consideration for the Finals MVP Award, averaging 35.8 points, 13.3 rebounds, and 8.8 assists per game for the championship round. During the 2015–16 season, James was criticized for his role in several off-court controversies, including the midseason firing of Cavaliers' coach David Blatt. Despite these distractions, Cleveland finished the year with 57 wins and the best record in the East. James's final averages were 25.3 points, 7.4 rebounds, and 6.8 assists per game on 52 percent shooting. In the playoffs, the Cavaliers advanced comfortably to the Finals, losing only two games en route to a rematch with the Warriors, who were coming off a record-setting 73-win season. To begin the series, Cleveland fell behind 3–1, including two blowout losses. James responded by registering back-to-back 41 point games in Games 5 and 6, leading the Cavaliers to two consecutive wins to stave off elimination. In Game 7, he posted a triple-double and made a number of key plays, including "The Block" on Andre Iguodala, as Cleveland emerged victorious, winning the city's first professional sports title in 52 years and becoming the first team in NBA history to come back from a 3–1 series deficit in the Finals. James became just the third player to record a triple-double in an NBA Finals Game 7, and behind series averages of 29.7 points, 11.3 rebounds, 8.9 assists, 2.3 blocks, and 2.6 steals per game, he also became the first player in league history to lead both teams in all five statistical categories for a playoff round, culminating in a unanimous Finals MVP selection. The 2016–17 season was marred by injuries and unexpected losses for the Cavaliers; James later described it as one of the "strangest" years of his career. Following a January defeat to the New Orleans Pelicans, he publicly criticized Cleveland's front office for constructing a team that he felt was too "top heavy", for which he received countercriticism. The Cavaliers finished the season as the East's second seed, with James averaging 26.4 points and career highs in rebounds (8.6), assists (8.7), and turnovers (4.1) per game. In Game 3 of the first round of the postseason, he registered 41 points, 13 rebounds, and 12 assists against the Pacers, leading Cleveland to a comeback victory after trailing by 25 points at halftime, representing the largest halftime deficit overcome in NBA playoff history. In Game 5 of the Conference Finals against the Celtics, James scored 35 points and surpassed Michael Jordan as the league's all-time postseason scoring leader. The Cavaliers won the game and the series, advancing to their third consecutive Finals against the Warriors. Behind averages of 33.6 points, 12 rebounds, and 10 assists per game, James became the first player to average a triple-double in the Finals, but Cleveland was defeated in five games. James protects the ball from Kyrie Irving in October 2017. The two were teammates in Cleveland for three seasons. Prior to the start of the 2017–18 season, the Cavaliers overhauled their roster by trading Kyrie Irving to the Celtics, who requested a trade in part because he no longer wanted to play with James. After a slow start to the year, Cleveland rebounded by winning 18 of 19 games in December. 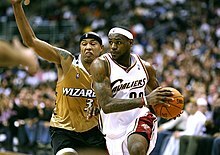 Their turnaround began with a victory over the Wizards where James scored 57 points, which represented the second-highest point total of his career and tied a franchise record. In January, the Cavaliers had a losing record, and James was criticized for his lackluster effort. Following another round of trades in February, Cleveland returned to form and James reached a number of historical milestones; for example, on March 30, he set an NBA record with 867 straight games scoring in double digits. James eventually finished the season with averages of 27.5 points, 8.6 rebounds, and a career-high 9.2 assists and 4.2 turnovers per game. In the playoffs, he guided the Cavaliers to another Finals rematch with the Warriors. Along the way, he had some of the most memorable moments of his career, including a game-winning shot against the Pacers and another against the Raptors. In the first game of the Finals, James scored a playoff career-high 51 points, but Cleveland was defeated in overtime. Following the defeat, James injured his hand after punching a wall in the locker room, which hindered his effectiveness for the remainder of the series. The Cavaliers lost the series in four games, with James averaging 34 points, 8.5 rebounds, and 10 assists per game for the Finals. On June 29, 2018, James opted out of his contract with the Cavaliers and became an unrestricted free agent. On July 1, his management company, Klutch Sports, announced that he would sign with the Los Angeles Lakers; the deal was officially completed on July 9. In an interview with Sports Illustrated, James's agent, Rich Paul, explained, "In 2010, when he went to Miami, it was about championships. In 2014, when he went back to Cleveland, it was about delivering on a promise. In 2018, it was just about doing what he wants to do." Reaction to the move was more positive than his original departure from the Cavaliers, albeit still mixed, as some onlookers felt that Los Angeles was not his optimal destination. On November 14, 2018, James scored 44 points in a 126–117 win over the Portland Trail Blazers, passing Wilt Chamberlain for fifth on the all-time NBA scoring list. On November 18, he scored a season-high 51 points in a 113–97 win over the Heat. After sustaining a groin injury on December 25 against the Warriors, James had the longest absence of his 16-year career, missing 17 games. The Lakers went 6–11 over that stretch. In February 2019, he became the fifth NBA player to reach 32,000 points. In a game against the Denver Nuggets on March 6, 2019, James surpassed Michael Jordan for fourth place on the NBA career scoring leaders list, by way of a successful fouled layup with 5:38 remaining in the second quarter. The following day, James and the Lakers agreed to a playing time restriction for him valid for the remaining 17 games of the regular season. The 2018–19 Lakers were expected to end their post-season drought of five seasons. However due to injuries and inconsistent play by the Lakers, they were officially eliminated from the playoffs again after losing to the Brooklyn Nets, 106–111 on March 22. With this loss, James missed the playoffs for the first time since the 2004–05 season, and failed to reach the NBA Finals for the first time since the 2009-10 season. Previously, James's teams appeared in the NBA Finals in eight consecutive seasons (from 2011 to 2018). On March 30, the Lakers released a statement indicating that James would sit out the remaining six games of the season due to a recurring groin injury. In the 2018-19 season, he played only 55 games, which was the fewest games he had ever played in a single season since he began his career in the NBA. James made his debut for the United States national team at the 2004 Olympics in Athens, Greece. He spent the Games mostly on the bench, averaging 14.6 minutes per game with 5.8 points and 2.6 rebounds per game in eight games. Team USA finished the competition with a bronze medal, becoming the first U.S. basketball team to return home without a gold medal since adding active NBA players to their line-up. James felt his limited playing time was a "lowlight" and believed he was not given "a fair opportunity to play". His attitude during the Olympics was described as "disrespectful" and "distasteful" by columnists Adrian Wojnarowski and Peter Vecsey, respectively. At the 2006 FIBA World Championship in Japan, James took on a greater role for Team USA, averaging 13.9 points, 4.8 rebounds, and 4.1 assists per game as co-captain. The team finished the tournament with an 8–1 record, winning another bronze medal. James's behavior was again questioned, this time by teammate Bruce Bowen, who confronted James during tryouts regarding his treatment of staff members. Before naming James to the 2008 Olympic team, Team USA managing director Jerry Colangelo and coach Mike Krzyzewski gave James an ultimatum to improve his attitude, and he heeded their advice. At the FIBA Americas Championship 2007, he averaged 18.1 points, 3.6 rebounds, and 4.7 assists per game, including a 31-point performance against Argentina in the championship game, the most ever by an American in an Olympic qualifier. Team USA went 10–0, winning the gold medal and qualifying for the 2008 Olympics in Beijing, China. James credited the team's attitude and experience for their improvement, saying: "I don't think we understood what it meant to put on a USA uniform and all the people that we were representing in 2004. We definitely know that now." At the Olympics, Team USA went unbeaten, winning their first gold medal since 2000. In the final game, James turned in 14 points, 6 rebounds, and 3 assists against Spain. James did not play at the 2010 FIBA World Championship but rejoined Team USA for the 2012 Olympics in London, England. He became the leader of the team with Kobe Bryant, who would soon be 34, stepping back. James facilitated the offense from the post and perimeter, called the defensive sets, and provided scoring when needed. During a game against Australia, he recorded the first triple-double in U.S. Olympic basketball history with 11 points, 14 rebounds and 12 assists. [b] Team USA went on to win their second straight gold medal, again defeating Spain in the final game. James contributed 19 points in the win, becoming the all-time leading scorer in U.S. men's basketball history. He also joined Michael Jordan as the only players to win an NBA MVP award, NBA championship, NBA Finals MVP, and Olympic gold medal in the same year. Afterwards, Krzyzewski said James "is the best player, he is the best leader and he is as smart as anybody playing the game right now." Standing 6 feet 8 inches (2.03 m) and weighing 250 pounds (113 kg), James has started at small forward and power forward, but he can also play the other three positions. Throughout most of his career, he has controlled the offense as the primary ball handler on his team. His athletic and versatile playing style has drawn comparisons to Hall of Famers Oscar Robertson, Magic Johnson, and Michael Jordan. James's career averages are 27.2 points, 7.4 rebounds, 7.2 assists, 1.6 steals and 0.8 blocks per game. Since 2011, he has been ranked the best player in the NBA by ESPN and Sports Illustrated. James drives to the basket in March 2008. A deft finisher, he led the NBA in scoring and shooting percentage at the rim in 2013. As an 18-year-old rookie, James led the Cavaliers in scoring. He holds numerous "youngest to" distinctions, including being the youngest player to score 30,000 career points. During his first stint in Cleveland, he was used primarily as an on-ball point forward, and although his shooting tendencies were perimeter-oriented, he established himself as one of the best slashers and finishers in basketball. His combination of speed, quickness, and size often created matchup problems for opposing teams because he was capable of blowing by larger defenders and overpowering smaller ones. These qualities became more apparent in transition, where he developed a reputation for grabbing defensive rebounds and then beating the defense downcourt for highlight reel baskets. Around this time, James was frequently criticized for not having a reliable jump shot or post game. Teams would try to exploit these weaknesses by giving him space in the half court and forcing him to settle for three-pointers and long two-pointers, a strategy famously used by Spurs coach Gregg Popovich in the 2007 Finals, where James converted on only 36 percent of his field goals in four games. In Miami, Heat coach Erik Spoelstra changed James's role to a more unconventional one. James spent more time in the post and improved his shot selection and accuracy on jump shots. He also learned how to work as an off-ball cutter in the Heat's "pass-happy" offense. Behind these improvements, James's overall scoring efficiency rose to historically great levels. ESPN's Tom Haberstroh called James's free-throw shooting his biggest weakness, describing it as "average". Upon returning to the Cavaliers, James began to experience subtle age-related declines in productivity, posting his lowest scoring averages since his rookie season in 2015 and 2016. His shooting also temporarily regressed, and he briefly ranked as the NBA's worst high-volume shooter from outside the paint. Despite these changes, he has remained an elite offensive player who can beat defenses with body control, strength, and varying attacking speeds. James's playmaking ability is generally considered one of his premier skills; some analysts rank him among the greatest passers in NBA history. By exploiting his size, vision, and the attention he garners from opposing defenses, James creates easy points for his teammates with accurate assists. He executes unconventional passes, including after leaving his feet and through defensive traffic. His uncanny tendency to find the open man has helped force NBA teams to incorporate some elements of zone into their schemes to better cover the weak side of the court and prevent James from passing to open shooters. Early in James's career, he was criticized for overpassing in pressure situations; specifically, for passing instead of shooting in the waning seconds of close games. However, as his career progressed, James's clutch performance was viewed more favorably. At the beginning of James's NBA career, he was considered a poor defensive player, but he improved steadily through the years. In 2009, he became proficient at the chase-down block, which involves coming in from behind the opposition in transition to block their shot. In Miami, he developed into a more versatile defensive player, and the Heat relied on him to guard all five positions. Along with Shane Battier and Dwyane Wade, Miami used James in an ultra-aggressive defensive scheme, with James cheating off the ball to help out inside or get into rebounding position. Beginning in 2014, some analysts noted a regression in his defensive impact, stemming from a lack of effort and expected age-related declines. His defense progressively declined during his second stint in Cleveland. After a missed drive on offense, he often dawdled back on defense while complaining to the referees. He provided less help on defense, and was less aggressive in switching. James himself admitted to taking plays off at times, referring to this approach as "chill mode". He eventually developed a reputation for raising his defensive level in the playoffs, which some analysts referred to as "Playoff LeBron". James left high school as one of the most hyped NBA prospects of all-time. [c] Upon entering the NBA, he made an immediate impact and was voted Rookie of the Year in his debut season. As of June 2018, he has been named to 14 All-NBA teams, which is tied for the fourth-most in league history, and 12 All-NBA first teams, which is an NBA record. His four MVP awards are matched only by Kareem Abdul-Jabbar, Wilt Chamberlain, Michael Jordan, and Bill Russell; James and Russell are the only players to win four MVP awards in a five-year span. James has also won three Finals MVP Awards, tied for the second-most all-time, and earned All-Defensive honors every season from 2009 to 2014. While he has never won the Defensive Player of the Year Award, he has finished second in the voting twice and lists it as one of his main goals. His teams have appeared in the Finals nine times and won three championships. Some analysts have criticized him for not having a better Finals record, while others have defended him, arguing that James usually performed well, but his team was defeated by superior competition. James is widely considered to be one of the greatest basketball players ever. In February 2016, he was ranked fifth by Sports Illustrated; in March 2016, he was ranked third by ESPN; in February 2017, he was ranked second by CBS Sports; in December 2017, he was ranked second by Fox Sports; and in February 2018, he was ranked second by Slam Magazine. He is sometimes mentioned as the greatest player ever, which has resulted in frequent comparisons to Michael Jordan. In February 2018, Bill Simmons' website, The Ringer, spent an entire week devoted to both players, with Simmons ultimately concluding that Jordan was still ahead. Coaches and players have also debated James's status, such as Steve Kerr, who posited that James and Jordan are the two best players in history. Brian Windhorst, who spent his career covering James, said, "No one has ever had as much hype as James has had to live up to, and James has delivered on every last drop." James has three children with Savannah Brinson, his high school sweetheart: Lebron, Jr. (b. 2004), Bryce (b. 2007), and Zhuri (b. 2014). James proposed to Brinson at a December 31, 2011, party celebrating New Year's Eve and his 27th birthday, and the two were married on September 14, 2013, in San Diego, California. During his stint with the Heat, James resided in Coconut Grove, where he bought a $9 million three-story mansion overlooking Biscayne Bay. In November 2015, James bought a 9,350 square-foot (870 m2) East Coast-style mansion in Brentwood, Los Angeles, for about $21 million. By 2015, James was considered by many people, including his fellow NBA players, to be the "face of the NBA". His opinions have yielded significant influence on people who make important league decisions; for example, in 2014 he asked commissioner Adam Silver to increase the duration of the All-Star break, and the request was granted the following season. On February 13, 2015, James was elected the first vice president of the National Basketball Players Association (NBPA). Throughout his career, James has been ranked by Forbes as one of the world's most influential athletes, and in 2017, he was listed by Time as one of the 100 most influential people in the world. During his first stint with the Cavaliers, he was adored by local fans, and Sherwin-Williams displayed a giant Nike-produced banner of James on its world headquarters. Despite their affection for James, Cleveland fans and critics were frequently annoyed when he sported a Yankees hat when he attended Cleveland Indians baseball games versus the New York Yankees. Following his actions during the 2010 free agency period and, more specifically, The Decision, he was listed as one of most disliked athletes in the US. By 2013, his image had mostly recovered and he was reported by ESPN as the most popular player in the NBA for the second time in his career. In 2014, he was named the most popular male athlete in America by the Harris Poll. He has led the league in jersey sales six times. In March 2008, James became the first black man—and third man overall after Richard Gere and George Clooney—to appear on the cover of Vogue, when he posed with Gisele Bündchen. In response, noted ESPN columnist Jemele Hill considered the cover offensive and "memorable for the wrong reasons", describing the demeanor of James and his holding Bündchen as a reference to classic imagery of the movie monster King Kong, a dark savage capturing his light-skinned love interest. James is represented by agent Rich Paul of Klutch Sports. His first agent was Aaron Goodwin, whom he left in 2005 for Leon Rose. Rose joined Creative Artists Agency (CAA) in 2007, and he worked with fellow CAA agent Henry Thomas, who represented Dwyane Wade and Chris Bosh, to bring James to Miami in 2010. James left CAA for Paul in 2012. James, Paul, Maverick Carter, and Randy Mims—all childhood friends—formed agent and sports-marketing company LRMR after James left Goodwin. LRMR handles James's marketing, including the marketing of The Decision, for which it was criticized. 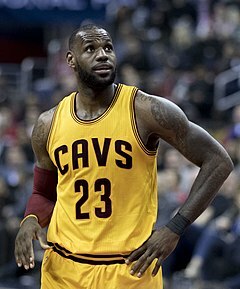 Throughout his career, James has taken a unique approach to his NBA contracts, usually opting to sign shorter-term deals in order to maximize his earnings potential and flexibility; for example, in 2006, he and the Cavaliers negotiated a three-year, $60 million contract extension instead of the four-year maximum as it allotted him the option of seeking a new contract worth more money as an unrestricted free agent following the 2010 season. This move ultimately allowed James, Dwyane Wade, and Chris Bosh to sign together with the Heat. During his second stint in Cleveland, he began opting out and re-signing on new contracts after each season in order to take advantage of higher salaries resulting from the NBA's rising salary cap. In 2016, he signed with the Cavaliers on a three-year deal, becoming the highest-paid player in the league for the first time in his career. James has signed numerous endorsement contracts; some of the companies that he has done business with are Audemars Piguet, Coca-Cola, Dunkin' Brands, McDonald's, Nike, State Farm and Beats by Dre. Coming out of high school, he was the target of a three-way bidding war among Nike, Reebok, and Adidas, eventually signing with Nike for approximately $90 million. His signature shoes have performed well for Nike. In 2011, Fenway Sports Group became the sole global marketer of his rights, and as part of the deal, he was granted a minority stake in the English Premier League football club Liverpool, who he has claimed his support for. As a result of James's endorsement money and NBA salary, he has been listed as one of the world's highest-paid athletes. In 2013, he surpassed Kobe Bryant as the highest paid basketball player in the world, with earnings of $56.5 million. In 2014, James realized a profit of more than $30 million as part of Apple's acquisition of Beats Electronics; he had originally struck a deal to get a small stake in the company at its inception in exchange for promoting its headphones. In 2015, he was ranked the sixth highest earning sportsperson, and third highest in 2016 (after Cristiano Ronaldo and Lionel Messi). James has stated that he would like to own an NBA team in the future, albeit in a hands-off capacity. James and comedian Jimmy Kimmel co-hosted the 2007 ESPY Awards. In other comedic pursuits, he hosted the 33rd-season premiere of Saturday Night Live. He has also tried his hand at acting, appearing in a cameo role on the HBO series Entourage. In 2015, he played himself in the Judd Apatow film Trainwreck, receiving positive reviews for his performance. That same year, James's digital video company, Uninterrupted, raised $15.8 million from Warner Bros. Entertainment and Turner Sports to help expand the company's efforts to bring athlete-created content to fans. It is hosted on Bleacher Report and is used by several other athletes including New England Patriots tight end Rob Gronkowski and Seattle Seahawks cornerback Richard Sherman. James and his business partner Maverick Carter own production company SpringHill Entertainment, whose first work was the Lions Gate documentary More Than a Game, which was released in 2009 and chronicled James's high school years. Series produced by SpringHill include NBC game show The Wall, the Disney XD sports documentaries Becoming, Starz sitcom Survivor's Remorse, and animated web series The LeBrons. In 2016, CNBC aired an unscripted series hosted by James called Cleveland Hustles, where four up-and-coming Northern Ohio entrepreneurs will be financed on the condition of revitalizing a neighborhood in Cleveland. In the 2017 Toronto International Film Festival, a 60-minute Vince Carter documentary entitled The Carter Effect was executive produced by James and Maverick Carter along with rapper Drake and Future the Prince. In February 2018 it was announced that James' production company will produce a new film in the House Party series with James expected to make a cameo. Later that month, Fox News journalist Laura Ingraham told James to "Shut up and dribble" as a response to his political agendas. This largely contributed to James creating a documentary series looking at the changing role of athletes in the current political and cultural climate, aptly named, Shut Up and Dribble on Showtime. James is an active supporter of non-profit organizations, including After-School All-Stars, Boys & Girls Clubs of America, and Children's Defense Fund. He also has his own charity foundation, the LeBron James Family Foundation, which is based in Akron. Since 2005, the foundation has held an annual bike-a-thon to raise money for various causes. In 2015, James announced a partnership with the University of Akron to provide scholarships for as many as 2,300 children beginning in 2021. In 2016, he donated $2.5 million to the Smithsonian National Museum of African American History and Culture to support an exhibit on Muhammad Ali. In 2017, he received the J. Walter Kennedy Citizenship Award from the NBA for his "outstanding service and dedication to the community." In November of that same year, the Akron School Board approved the "I Promise School", a public elementary school created in a partnership with the LeBron James Family Foundation to help struggling elementary school students stay in school. James later reflected that it was his most important professional accomplishment of his life. The school officially opened on July 30, 2018. Throughout his career, James has taken stances on controversial issues. On several occasions, he mentioned a feeling of obligation to affect change using his status. Those include the War in Darfur, the Trayvon Martin case, the now-former NBA owner Donald Sterling's racist comments in 2014, the Michael Brown verdict, and the death of Eric Garner. Following a racist incident at his Los Angeles home in 2017, James expressed, "being black in America is tough. We got a long way to go for us as a society and for us as African Americans until we feel equal in America." Later on that year, in the aftermath of the Unite the Right rally, James questioned the "Make America Great Again" slogan and said, "It's sad what's going on in Charlottesville. Is this the direction our country is heading? Make America Great Again huh?" He then said that "Our youth deserve better!!" James also called Trump a "bum" after the president rescinded a White House invitation to Stephen Curry. During a 2018 interview with CNN journalist Don Lemon, James accused Trump for attempting to divide the country with sports, suggesting that "sports has never been something that divides people it's always been something that brings someone together." He declared he would "never sit across from him. I'd sit across from Barack though." In response, Trump tweeted, "LeBron James was just interviewed by the dumbest man on television, Don Lemon. He made LeBron look smart, which isn't easy to do." James has supported Colin Kaepernick in the aftermath of his participation in the national anthem protests, claiming that he was being "blackballed" from a new contract in the National Football League, and that he would hire him if he owned a football team. He has worn his clothing in a show of support several times. In June 2008, James donated $20,000 to a committee to elect Barack Obama as president. Later that year, James gathered almost 20,000 people at the Quicken Loans Arena for a viewing of Obama's 30-minute American Stories, American Solutions television advertisement. The advertisement was shown on a large screen above the stage, where Jay-Z later held a free concert. In November 2016, James endorsed and campaigned for Hillary Clinton for the 2016 presidential election. 2009 My Wife and Kids Himself Episode: "Outbreak Monkey"
Entourage Episode: "Give a Little Bit"
2015 Survivor's Remorse Episode: "Guts"
2016 Teen Titans Go! Episode: "The Cruel Giggling Ghoul"
^ These include Ryan Jones,:91 Tim Graham, John Breech, Bill Barnwell, and Ryan Wilson. ^ Assists were recorded as an official Olympic statistic starting in 1976. ^ These include Ryan Jones,:142 Jay Bilas, Chris Broussard, Sam Smith, and Chad Ford. ^ Lynch, Andrew (May 31, 2017). "Here's why LeBron James is the best NBA player of all time". FoxSports. Retrieved May 12, 2018. ^ Fromal, Adam (April 27, 2017). "LeBron Is the Best Player the NBA Has Ever Seen, Even If He's Not the GOAT". Bleacher Report. Retrieved May 12, 2018. ^ Armen-Graham, Bryan (June 11, 2017). "It's time to call LeBron James what he is: the NBA's greatest ever player". The Guardian. Retrieved May 12, 2018. ^ Baillie, Ryan (December 4, 2017). "LeBron James Is The Best NBA Player Of All Time And It Is Time To Accept It". Odyssey Online. Retrieved September 14, 2017. ^ a b c d e f g h i j k l m Jones, Ryan (2003). King James: Believe the Hype. New York: St. Martin's Griffin. ISBN 978-0-312-34992-9. ^ Donegan, Lawrence (March 2, 2003). "America's most wanted". The Guardian. Retrieved May 29, 2018. ^ a b "LeBron James Biography". JockBio.com. Retrieved May 23, 2010. ^ Nichols, Rachel (July 30, 2018). "LeBron James opens up on his new school, the Lakers and life's challenges". ESPN. Retrieved July 31, 2018. ^ Covert, Colin (October 15, 2009). "Movie review: Band of brothers in 'More Than a Game'". Star Tribune. Retrieved July 1, 2012. ^ a b c d e f g "Prospect Profile: LeBron James". NBA.com. Retrieved March 4, 2013. ^ Lee Morgan, David; Gaffney, Tom (March 26, 2000). "Winning one for Carter". Akron Beacon Journal. p. D8. Retrieved July 3, 2018 – via Newspapers.com. ^ a b c d "LeBron James stats, details, videos, and news". NBA.com. Retrieved May 27, 2017. ^ Abrams, Jonathan (May 2, 2010). "Heading Home to Celebrate". The New York Times. Retrieved May 30, 2012. ^ Jones, Ryan (December 30, 2014). "Ohio Player". SLAM Magazine. Retrieved May 27, 2012. ^ "What Is the NBA's Educational Requirement?". Reference. ^ Garner, Dwight (September 9, 2009). "An N.B.A. Giant and How He Grew". The New York Times. p. C1. Retrieved May 3, 2010. ^ Withers, Tom (July 24, 2009). "LeBron's Book Shows Struggle With Fame". CBS News. Retrieved January 30, 2018. ^ a b c "James ruled ineligible, plans to appeal decision". ESPN. ESPN.com News Services. January 31, 2003. Retrieved March 8, 2009. ^ "Prep star James can continue drive for state title". ESPN. Associated Press. January 27, 2003. Retrieved March 8, 2009. ^ "2009–2010 NCAA Division I Manual" (PDF). National Collegiate Athletic Association. August 2009. p. 163. ^ Bolch, Ben (February 9, 2003). "James Is Too Much for Westchester". Los Angeles Times. Retrieved August 18, 2014. ^ "Boys Basketball D2 State Champs". Retrieved June 12, 2018. ^ Ward, Austin (June 2, 2016). "Remember that time Urban Meyer tried to recruit LeBron James?". ESPN. Retrieved February 3, 2018. ^ Abrams, Jonathan (May 3, 2009). "LeBron James: Two Sports, One Superstar". The New York Times. Retrieved May 27, 2012. ^ Graham, Tim (May 31, 2009). "LBJ and NFL: A fantasy based in reality". ESPN. Retrieved August 9, 2009. ^ Breech, John (May 27, 2013). "Theismann: LeBron James is 'talented enough' to be an NFL QB". CBS Sports. Retrieved May 27, 2013. ^ Barnwell, Bill (August 5, 2013). "Could LeBron James Really Play in the NFL?". Grantland. Retrieved August 14, 2013. ^ Wilson, Ryan (August 12, 2013). "Mike Wallace latest to say LeBron James would dominate NFL". CBS Sports. Retrieved August 14, 2013. ^ "2003 NBA Draft". Basketball Reference. Sports Reference. Retrieved April 13, 2013. ^ "Expectations for James more than met". ESPN. Associated Press. October 30, 2003. Retrieved May 30, 2012. ^ a b "LeBron James: Player Info Page". NBA.com. Archived from the original on May 16, 2007. Retrieved April 27, 2007. ^ "20-5-5: Tyreke Evans makes rookie history". News10/KXTV. Associated Press. Archived from the original on September 21, 2013. Retrieved April 13, 2013. ^ "2003–04 Cleveland Cavaliers". Basketball Reference. Sports Reference. Retrieved April 27, 2007. ^ "2005 NBA All-Star Game". Basketball Reference. Sports Reference. Retrieved February 4, 2018. ^ Pierce, Charles (February 21, 2005). "The Future Is Now". Sports Illustrated. Retrieved May 21, 2017. ^ a b "2004–2005 Season" (PDF). NBA. Retrieved June 2, 2012. ^ "2004–05 Cleveland Cavaliers". Basketball Reference. Sports Reference. Retrieved April 29, 2007. ^ Sheridan, Chris (February 19, 2006). "LeBron and Pistons lead East to All-Star game win". ESPN. Retrieved February 4, 2018. ^ a b c d e f g h i j k l m "LeBron James NBA & ABA Stats". Basketball Reference. Sports Reference. Retrieved April 21, 2013. ^ "James, Nash share Sporting News MVP award". ESPN. Associated Press. May 12, 2006. Retrieved May 5, 2007. ^ "James, Cavs Top Mavs To Clinch Playoff Berth". NBA.com. March 29, 2006. Retrieved May 1, 2007. ^ "James' playoff debut triple-double carries Cavs". ESPN. Associated Press. April 22, 2006. Retrieved May 1, 2007. ^ The NBA Realist (May 3, 2011). "Kobe Bryant vs. Lebron James: Game Winning Shots". Chasing 23. Archived from the original on May 31, 2013. Retrieved June 1, 2013. ^ "2006 NBA Playoffs Summary". Basketball Reference. Sports Reference. Retrieved April 13, 2013. ^ Windhorst, Brian (October 2, 2013). 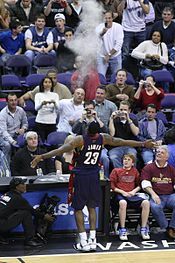 "LeBron James returns to chalk toss". ESPN. Retrieved November 24, 2013. ^ Mandell, Nina (October 30, 2014). "LeBron James is bringing the chalk toss back after 95% of Twitter users voted yes". USA Today. Retrieved November 16, 2014. ^ Simmons, Bill (2009). The Book of Basketball. New York: ESPN Books. p. 499. ISBN 9780345511768. ^ "2006–07 Cleveland Cavaliers". Basketball Reference. Sports Reference. Retrieved April 29, 2007. ^ "LeBron bewilders Pistons as Cavaliers inch closer to NBA finals". ESPN. Associated Press. June 1, 2007. Retrieved May 31, 2007. ^ a b ESPN.com Staff (June 20, 2012). "Greatest NBA playoff performances". ESPN. Retrieved June 23, 2012. ^ "Gibson's 31 points, James' balanced play puts Cavs in NBA Finals". ESPN. Associated Press. June 2, 2007. Retrieved December 11, 2016. ^ a b "2007 NBA Playoffs Summary". Basketball Reference. Sports Reference. Retrieved April 13, 2013. ^ "2007 NBA Finals". Basketball Reference. Sports Reference. Retrieved August 6, 2017. ^ "Allen's flurry of 3s help East hold on for All-Star win". ESPN. Associated Press. February 18, 2008. Retrieved February 4, 2018. ^ Starkey, Mike (March 21, 2008). "LeBron James becomes Cleveland Cavaliers all-time scoring leader". cleveland.com. Retrieved February 4, 2018. ^ Haberstroh, Tom (December 26, 2012). "LeBron James: 'Scoring not my job'". ESPN. Retrieved February 4, 2018. ^ "2007–08 NBA Standings". Basketball Reference. Sports Reference. Retrieved February 18, 2013. ^ "2008 NBA Playoffs Summary". Basketball Reference. Sports Reference. Retrieved April 13, 2013. ^ "Pierce, James duke it out as Celtics close out Cavs in Game 7". ESPN. Associated Press. May 19, 2008. Retrieved February 18, 2013. ^ MacMahon, Tim (May 28, 2011). "Stevenson: LeBron beef 'pretty much over'". ESPN. Retrieved April 13, 2013. ^ a b "Howard, Bryant headline 2008–09 NBA All-Defensive First Team". NBA.com. May 6, 2009. Archived from the original on May 8, 2009. ^ a b Abrams, Jonathan (May 5, 2010). "On Defense, James Is Closer Than He Appears". The New York Times. Retrieved June 11, 2013. ^ Simmons, Bill (2009). The Book of Basketball. New York: ESPN Books. p. 477. ISBN 9780345511768. ^ "LeBron sits as Cavs fail to match best home record". Toledo Blade. Associated Press. April 16, 2009. Retrieved February 18, 2013. ^ "James outdistances Bryant in winning Kia MVP award". NBA.com. May 4, 2009. Archived from the original on May 7, 2009. Retrieved May 4, 2009. ^ Hollinger, John (March 24, 2009). "PER Diem: March 24, 2009". ESPN Insider. ESPN. Retrieved October 8, 2017. ^ "2009 NBA Playoffs Summary". Basketball Reference. Sports Reference. Retrieved April 13, 2013. ^ "James' dramatic buzzer-beater drops Magic, evens series at 1–1". ESPN. Associated Press. May 23, 2009. Retrieved February 18, 2013. ^ a b "LeBron: Do what's best for team". ESPN. Associated Press. June 8, 2013. Retrieved June 8, 2013. ^ Schmitt Boyer, Mary (February 5, 2010). "Cleveland Cavaliers star LeBron James glad point-guard assignment is temporary". cleveland.com. Retrieved July 18, 2013. ^ "2009–10 NBA Season Summary". Basketball Reference. Sports Reference. Retrieved July 18, 2010. 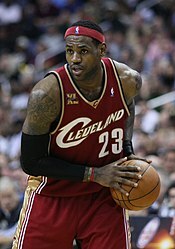 ^ "LeBron James Wins NBA's 2009–10 Most Valuable Player Award". Cleveland Cavaliers Official Website. May 2, 2010. Retrieved February 4, 2018. ^ a b "LeBron's triple-double not enough as Celtics move on to face Magic". ESPN. Associated Press. May 13, 2010. Retrieved July 15, 2010. ^ Moore, Matt (May 11, 2010). "NBA Playoffs Celtics Cavs Game 5: Celtics dominate as LeBron James fails in the big time". NBC Sports. Retrieved July 3, 2012. ^ "Celtics hand Cavaliers worst home playoff loss in team history". ESPN. Associated Press. May 11, 2010. Retrieved July 15, 2010. ^ "LeBron James goes home". ESPN The Magazine. July 11, 2014. Retrieved February 4, 2018. ^ "NBA Free Agency: Who's going where?". ESPN. June 30, 2010. Retrieved October 30, 2010. ^ "LeBron says he'll sign with Miami Heat". Fox Sports. August 9, 2010. Retrieved October 30, 2010. ^ Windhorst, Brian (July 8, 2011). "A look back at the fateful 'Decision'". ESPN. Retrieved April 27, 2013. ^ Starting Blocks, The Plain Dealer (July 12, 2010). "LeBron James' 'Decision' generated $6 million in ad revenue". cleveland.com. Retrieved June 10, 2012. ^ "Wade granted one of his wishes with Bosh coming to Miami". NBA.com. Associated Press. July 7, 2010. Archived from the original on September 15, 2010. Retrieved October 30, 2010. ^ Windhorst, Brian (July 10, 2010). "Inside 'The Decision': Miami's coup was a 'surprise' built on long-coveted goal of James, Wade and Bosh". The Plain Dealer. Archived from the original on November 9, 2010. Retrieved November 9, 2010. ^ a b Thomsen, Ian (July 19, 2010). "The Plot Starts Here ... Showtime Starts Here". Sports Illustrated. Retrieved March 8, 2018. ^ Biggane, Brian (July 10, 2010). "LeBron James admits Pat Riley sold him on being part of a family with Miami Heat". The Palm Beach Post. Retrieved July 3, 2012. ^ "Open Letter to Fans from Cavaliers Majority Owner Dan Gilbert" (Press release). Cleveland Cavaliers. July 8, 2010. Archived from the original on July 9, 2010. Retrieved November 9, 2010. ^ Ron, Nurwisah (November 9, 2010). "Cleveland Plain Dealer's final word on LeBron James". National Post. Archived from the original on November 9, 2010. ^ Abrams, Jonathan; Shipp, Catherine (July 10, 2010). "Criticism Grows as James Arrives in Miami". The New York Times. Archived from the original on November 9, 2010. Retrieved November 9, 2010. ^ ESPN.com News Services (July 19, 2010). "Jordan wouldn't have called Magic, Bird". ESPN. Retrieved July 19, 2010. ^ Rothbard, Barry (July 20, 2010). "Magic Johnson Says He Wouldn't Have Joined Bird After LeBron James's Move". Bloomberg L.P. Archived from the original on November 9, 2010. Retrieved November 9, 2010. From college, I was trying to figure out how to beat Larry Bird. ^ Freeman, Mike (September 30, 2010). "Lambasted LeBron conveniently sees hurtful role of race". CBS Sports. Archived from the original on November 9, 2010. Retrieved November 9, 2010. He has catered to corporate America, mostly ignored issues that affect people of color, and then when so many people turned on James, he's now suddenly seeing the racial light. ^ Whitlock, Jason (September 30, 2010). "Point the finger at yourself, LeBron". Fox Sports. Archived from the original on November 9, 2010. Retrieved November 9, 2010. LeBron's enablers are providing him the racial cocoon of denial. They're giving LeBron an excuse to avoid dealing with his own bad (The) Decision. ^ McCarthy, Michael (February 8, 2012). "Forbes: Vick, Tiger among most 'disliked' athletes". USA Today. Archived from the original on June 27, 2012. ^ a b Weir, Tom (December 6, 2011). "LeBron James expresses regrets about 'The Decision'". USA Today. Archived from the original on June 27, 2012. ^ Wetzel, Dan (December 21, 2010). "LeBron's decisive backlash tops all stories". Yahoo Sports. Archived from the original on June 27, 2012. ^ Kerasotis, Peter (December 25, 2011). "For Miami Heat, High Hopes but Lower Volume". The New York Times. p. SP8. Retrieved June 27, 2012. ^ Kaplan, Thomas (November 1, 2010). "James Faces Jeering, but Little Competition". The New York Times. Retrieved November 5, 2010. 'If I had to go back on it, I probably would do it a little bit different,' James said before the game. 'But I'm happy with my decision.' He declined to be more specific. ^ a b ESPN.com News Services (July 10, 2010). "Heat stars sign six-year deals". ESPN. Retrieved March 10, 2018. ^ Hochman, Benjamin (July 9, 2010). "LeBron James' choice puts Miami back in the game". The Denver Post. Retrieved July 13, 2010. ^ "Heat throw welcome party for LeBron James, Chris Bosh". USA Today. Associated Press. July 9, 2010. Retrieved November 4, 2010. With 13,000 fans chanting "Yes We Did!" amid an atmosphere more suited to a rock concert than a basketball game, the Miami Heat welcomed the NBA's newest trio of superstars Friday night for a celebration unlike just about any other in team history. ^ Wade, Dwyane; Bosh, Chris; James, LeBron (July 10, 2010). "On Stage Interview with Wade, Bosh and James – July 9, 2010". NBA.com (Interview). Interviewed by Eric Reid. Retrieved June 13, 2012. ^ Wharton, David (January 10, 2012). "Miami's upgrade status holds lessons for Clippers". Los Angeles Times. Retrieved June 13, 2012. ^ Beck, Howard (October 26, 2010). "Shift in Talent Fortifies Elite Teams". The New York Times. p. B–12. Archived from the original on November 9, 2010. Retrieved November 9, 2010. In that moment on July 9, amid the pyrotechnics, the Miami Heat became a national Rorschach test. Everyone saw something: greatness, arrogance, self-indulgence, boldness, cowardice, pride, friendship, collusion, joy, cynicism, heroes, mercenaries. ^ a b c Windhorst, Brian (December 7, 2011). "LeBron James: No more Mr. Bad Guy". ESPN. Retrieved June 28, 2012. ^ a b Magoloff, Scott (July 12, 2014). "LeBron James: A timeline of his Miami Heat career". Miami Herald. Retrieved March 10, 2018. ^ "LeBron James returns to Cleveland". ESPN. Associated Press. December 3, 2010. Archived from the original on March 10, 2011. ^ "LeBron shrugs off boos in return to Cleveland to lead Heat to easy win". ESPN. Associated Press. December 2, 2010. Archived from the original on March 10, 2011. ^ "2010-11 NBA Season Summary". Basketball Reference. Sports Reference. Retrieved March 10, 2018. ^ a b "2011 NBA Playoffs Summary". Basketball Reference. Sports Reference. Retrieved February 19, 2013. ^ Windhorst, Brian (May 12, 2011). "1. One Year Later, Sweet Turnaround For James". ESPN. Retrieved March 10, 2018. ^ "Heat's LeBron James closes out Celtics in Game 5: Video". cleveland.com. Associated Press. May 12, 2011. Retrieved March 10, 2018. ^ "Kevin Durant, Thunder pull away from Heat, win Game 1". ESPN. Associated Press. June 12, 2012. Archived from the original on June 13, 2012. ^ Hollis, Charles (June 15, 2011). "Hot Corner: With NBA title at stake, LeBron James was a big flop". cleveland.com. Retrieved March 10, 2018. ^ a b c d e Goldsberry, Kirk. "The Evolution of King James". Grantland. Retrieved April 21, 2013. ^ Dwork, David (February 5, 2012). "Heat top Raptors, tie best start in franchise history". Hot Hot Hoops. Retrieved May 27, 2017. ^ "LeBron James wins 3rd NBA MVP award". CBS News. Associated Press. May 12, 2012. Retrieved June 22, 2012. ^ "LeBron James scores 20,000th". ESPN. Associated Press. January 17, 2013. Retrieved November 24, 2013. ^ ESPN.com News Services (May 17, 2012). "Roy Hibbert scores 19 and adds 18 boards as Pacers pound Heat". ESPN. Retrieved March 11, 2018. ^ "James' box score gem powers Heat". ESPN. ESPN Stats & Information. May 20, 2012. Retrieved March 10, 2018. ^ Windhorst, Brian (September 29, 2012). "LeBron eyeing 'point power forward' role?". ESPN. Archived from the original on June 29, 2018. ^ Vardon, Joe (March 5, 2016). "LeBron James is embracing playing power forward for the Cavaliers like never before". cleveland.com. Archived from the original on July 1, 2017. ^ Beck, Howard (June 7, 2012). "James Takes Game 6 Personally". New York Times. Retrieved March 10, 2018. ^ Abdul-Jabbar, Kareem (June 13, 2012). "Finals take edge off season's start". ESPN. Retrieved March 11, 2018. ^ "Heat overcome Russell Westbrook's 43 points, take 3–1 Finals lead". ESPN. Associated Press. Retrieved February 18, 2013. ^ "LeBron James, Heat dominate Thunder to win NBA championship". ESPN. Associated Press. June 22, 2012. Retrieved February 18, 2013. ^ Washburn, Gary (June 22, 2012). "MVP clear choice". The Boston Globe. Retrieved June 22, 2012. ^ Pelton, Kevin (June 10, 2013). "Best playoff runs: Players 1-5". ESPN Insider. ESPN. Retrieved May 21, 2017. 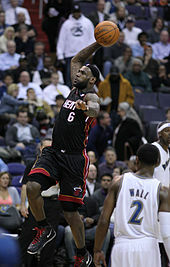 ^ "LeBron James sets NBA record in Heat's win against Blazers". ESPN. Associated Press. February 13, 2013. Retrieved May 26, 2013. ^ Stein, Marc (March 1, 2013). "Weekend Dime". ESPN. Retrieved March 31, 2013. ^ Jhabvala, Nicki. "Timeline of the Miami Heat's Winning Streak". The New York Times. Retrieved March 26, 2018. ^ Mahoney, Rob. "LeBron James' month for the ages". Sports Illustrated. Archived from the original on March 2, 2013. Retrieved March 31, 2013. ^ "Miami Heat Franchise Index". Basketball Reference. Sports Reference. Retrieved August 18, 2014. ^ "James wins 4th Kia MVP award in near unanimous vote". NBA.com. Associated Press. May 6, 2013. Retrieved March 26, 2018. ^ "LeBron James' layup as time expires in OT lifts Heat past Pacers". ESPN. Associated Press. May 22, 2013. ^ Garrison, Drew (May 31, 2013). "LeBron James says he went back to his 'Cleveland days' in Game 5". SB Nation. Retrieved June 3, 2013. ^ a b "2013 NBA Playoffs Summary". Basketball Reference. Sports Reference. Retrieved May 26, 2013. ^ Golliver, Ben. "Heat's LeBron James eyes Finals rematch with Spurs: 'I'm a much better player'". Sports Illustrated. Archived from the original on June 8, 2013. Retrieved June 7, 2013. ^ Pelton, Kevin (June 12, 2013). "What's wrong with LeBron James?". ESPN Insider. ESPN. Retrieved June 29, 2013. ^ "Ray Allen's late 3 forces OT, Heat edge Spurs to force Game 7". ESPN. Associated Press. June 18, 2013. Retrieved June 22, 2013. ^ "LeBron James named Finals MVP". ESPN. ESPN.com News Services. June 20, 2013. Retrieved June 21, 2013. ^ "2013 NBA Finals Composite Box Score". Basketball Reference. Sports Reference. Retrieved June 22, 2013. ^ "LeBron James' 61 points in win set career, Heat records". ESPN. Associated Press. March 4, 2014. Retrieved March 4, 2014. ^ "Pacers get top seed in East as short-handed Heat fall to Wizards". ESPN. Associated Press. April 15, 2014. Retrieved May 25, 2014. ^ Appleman, Jake (May 12, 2014). "Notebook: Heat 102, Nets 96". NBA.com. Retrieved May 25, 2014. ^ Windhorst, Brian (June 6, 2014). "Legacy grows for Miami's Big 3". ESPN. Retrieved May 31, 2014. ^ Young, Royce (June 6, 2014). "Air conditioning goes out in Game 1". ESPN. Retrieved June 6, 2014. ^ "LeBron James leads all scorers with 35 points as Heat take Game 2". ESPN. Associated Press. June 9, 2014. Retrieved June 8, 2014. ^ "Spurs shake early deficit to snuff out Heat and win 5th NBA title". ESPN. Associated Press. June 16, 2014. Retrieved August 10, 2014. ^ "2014 NBA Finals". Basketball Reference. Sports Reference. Retrieved June 21, 2014. ^ McMenamin, Dave (February 25, 2015). "LeBron breaks Scottie Pippen's mark". ESPN. Retrieved February 27, 2015. ^ McMenamin, Dave. "LeBron becomes Cavs' assist leader". ESPN. Retrieved April 4, 2015. ^ Broussard, Chris (June 24, 2014). "LeBron James will opt out of contract". ESPN. Retrieved June 24, 2014. ^ Zillgitt, Jeff; Amick, Sam (July 11, 2014). "LeBron James rejoins Cleveland Cavaliers in free agency". USA Today. Retrieved July 11, 2014. ^ Levin, Josh. "Nice Rebound!". Slate. Retrieved July 13, 2014. ^ Simmons, Bill. "God Loves Cleveland". Grantland. Retrieved July 13, 2014. ^ Lowe, Zach. "The Decision 2.0: OK, What's Next?". Grantland. Retrieved July 13, 2014. ^ a b Windhorst, Brian (July 12, 2014). "LeBron deal has eye on future cap". ESPN. Retrieved July 12, 2014. ^ Bloomberg News. "LeBron to Cleveland: I'm coming home". Chicago Tribune. Retrieved April 26, 2017. ^ ESPN News Services (August 23, 2014). "Kevin Love traded to Cavaliers". ESPN. Retrieved December 6, 2014. ^ Feldman, Dan (January 1, 2015). "LeBron James out two weeks with multiple injuries". NBC Sports. Retrieved January 25, 2015. ^ "LeBron James hits buzzer beater as Cavaliers edge Bulls". Yahoo Sports. Agence France-Presse. May 11, 2015. Retrieved May 10, 2015. ^ a b Moore, Matt (May 29, 2015). "The crown is forever heavy: LeBron James and his Finals legacy". CBS Sports. Retrieved September 22, 2018. ^ a b "2015 NBA Finals". Basketball Reference. Sports Reference. Retrieved June 18, 2015. ^ "Neck and neck: Just how close was Finals MVP voting?". Fox Sports. June 17, 2015. Retrieved July 24, 2016. ^ Windhorst, Brian (January 28, 2016). "For NBA coaches, is LeBron James really a big professional hazard?". ESPN. Retrieved June 22, 2016. ^ SN Staff (March 22, 2016). "LeBron not interested in discussing whether he unfollowed Cavs". ESPN. Retrieved June 22, 2016. ^ a b "2015-16 NBA Season Summary". Basketball Reference. Sports Reference. Retrieved June 22, 2016. ^ ESPN.com (April 7, 2016). "Chase for 73: Warriors one for the ages now". ESPN. Retrieved June 22, 2016. ^ a b "2016 NBA Finals". Basketball Reference. Sports Reference. Retrieved June 22, 2016. ^ Azande, J.A. (June 17, 2016). "LeBron James' transcendent performance sets Game 7 stage". ESPN. Retrieved June 22, 2016. ^ McMenamin, Dave (June 27, 2016). "When LeBron swooped in and changed the course of Cavs' history". ESPN. Retrieved June 29, 2016. ^ Bontemps, Tim (June 19, 2016). "Cavaliers end over 50 years of Cleveland sports heartbreak with first NBA championship". The Washington Post. Retrieved June 22, 2016. ^ "LeBron James wins NBA Finals MVP for 3rd time". NBA.com. Associated Press. June 19, 2016. Retrieved June 26, 2016. ^ Dan, Feldman (June 20, 2016). "LeBron James becomes first player on record to lead series in points, rebounds, assists, steals and blocks". NBC Sports. Retrieved June 22, 2016. ^ McMenamin, Dave (January 26, 2017). "'Fantasy' no more: LeBron James gives Cavs' season a wake-up call". ESPN. Retrieved April 24, 2017. ^ Vardon, Joe (March 12, 2017). "LeBron James posts second straight triple-double, Cavs snap three-game skid 116-104 over Magic". Cleveland.com. Retrieved April 24, 2017. ^ Joseph, Adi (January 24, 2017). "Cavs should send LeBron on in-season vacation after latest rant". USA Today. Retrieved April 24, 2017. ^ McMenamin, Dave (April 21, 2017). "LeBron James leads Cleveland to historic comeback win". ESPN. Retrieved April 24, 2017. ^ "James passes Jordan, Cavs back in Finals with 135-102 win". ESPN. Associated Press. May 25, 2017. Retrieved May 25, 2017. ^ Maloney, Jack (May 26, 2017). "Cavaliers set for third straight NBA Finals vs. Warriors after bouncing Celtics". CBS Sports. Retrieved August 5, 2017. ^ Zucker, Joseph (June 13, 2017). "LeBron James Becomes 1st Player to Average Triple-Double in NBA Finals History". Bleacher Report. Retrieved June 13, 2017. ^ a b West, Jenna (July 6, 2018). "Report: Kyrie Irving Never Wanted LeBron James to Return to the Cavaliers". Sports Illustrated. Retrieved August 15, 2018. ^ "In special shoes, LeBron's triple-double leads Cavs past Wiz". ESPN. Associated Press. December 17, 2017. Retrieved August 15, 2018. ^ "LeBron James scores 57, Cavaliers top Wiz 130-122, end skid". ESPN. Associated Press. November 3, 2017. Retrieved November 3, 2017. ^ Vejar, Alex (February 1, 2018). "LeBron James finished January with worst plus-minus of his career". ClutchPoints. Retrieved August 15, 2018. ^ "LeBron breaks Jordan record as Cavs down Pelicans 107-102". ESPN. Associated Press. March 30, 2018. Retrieved March 30, 2018. ^ "LeBron James reaches eighth straight NBA Finals as Cavaliers beat Celtics 87-79 in Game 7". Chicago Tribune. May 27, 2018. Retrieved August 15, 2018. ^ NBA.com Staff (May 6, 2018). "LeBron James' career playoffs buzzer-beaters". NBA.com. Retrieved August 15, 2018. ^ "Warriors withstand James' 51 points to win NBA Finals Game 1". ESPN. Associated Press. May 31, 2018. Retrieved May 31, 2018. ^ McMenamin, Dave; Windhorst, Brian (June 9, 2018). "LeBron James says he 'pretty much played the last three games with a broken hand'". ESPN. Retrieved August 15, 2018. ^ "2018 NBA Finals - Cavaliers vs. Warriors". Basketball Reference. Sports Reference. Retrieved August 15, 2018. ^ Maloney, Jack (June 29, 2018). "LeBron James opts out of Cavaliers contract and hits NBA free agency, report says". CBS Sports. Retrieved August 16, 2018. ^ "LeBron James agrees to four-year, $154-million contract with Los Angeles Lakers". NBA.com. July 1, 2018. Retrieved July 3, 2018. ^ "Lakers Sign LeBron James". NBA.com. July 9, 2018. Retrieved July 9, 2018. ^ Jenkins, Lee (July 11, 2018). "Fit For The King: LeBron James and the Lakers Form Hollywood's Ultimate Marriage". Sports Illustrated. Retrieved August 16, 2018. ^ McMenamin, Dave; Youngmisuk, Ohm (July 29, 2018). "'They just had to not f--- it up': The NBA's mixed reaction to the Lakers landing LeBron James". ESPN. Retrieved August 16, 2018. ^ "LeBron James passes Wilt Chamberlain for fifth on NBA's all-time scoring list". NBA.com. Retrieved November 15, 2018. ^ "LeBron James scores 51 points, Lakers roll past Heat 113-97". ESPN.com. November 18, 2018. Retrieved November 19, 2018. ^ "With LeBron back, Lakers outlast Clippers in OT 123-120". ESPN.com. January 31, 2019. Retrieved February 1, 2019. ^ "LeBron James landmark as Los Angeles Lakers thrashed by Indiana Pacers". February 6, 2019 – via www.bbc.co.uk. ^ "NBA: LeBron James overtakes Michael Jordan in all-time points scoring". March 7, 2019 – via www.bbc.co.uk. ^ Hoffman, Benjamin (March 6, 2019). "LeBron James Passes Michael Jordan, a Player He'll Always Be Chasing". The New York Times. ISSN 0362-4331. Retrieved March 8, 2019. ^ reports, From NBA Twitter and media. "Report: Lakers, LeBron agree to minutes restriction". NBA.com. Retrieved March 9, 2019. ^ "Sources: LeBron James to play on minutes restriction for rest of season". sports.yahoo.com. Retrieved March 9, 2019. ^ "Lakers' playoff odds crash after latest stumble". ESPN.com. March 3, 2019. Retrieved March 22, 2019. ^ "Lakers officially eliminated from NBA postseason contention by D'Angelo Russell and the Nets". sports.yahoo.com. March 22, 2019. Retrieved March 22, 2019. ^ Bryan, Rebecca (March 22, 2019). "James, Lakers look ahead after Tinseltown debut ends without playoff berth". sports.yahoo.com. Retrieved March 23, 2019. ^ "LeBron James Ruled Out For Remainder Of Season". basketball.realgm.com. Retrieved March 30, 2019. ^ a b c d "LeBron James Bio". USA Basketball. Retrieved February 26, 2013. ^ a b Thamel, Pete (July 28, 2008). "After Sitting in 2004, Ready to Stand and Deliver". The New York Times. Retrieved February 26, 2013. ^ "U.S.: 3-for-24 from 3-point range". ESPN. Associated Press. Retrieved February 26, 2013. ^ a b c Wojnarowski, Adrian (August 12, 2012). "Season of LeBron ends with Olympic gold medal". Yahoo Sports. Archived from the original on February 26, 2013. ^ Vecsey, Peter (February 6, 2005). "Get Coach K For Olympic Team". New York Post. Archived from the original on February 26, 2013. ^ a b "2006 USA Men's World Championship Team (8-1)". USA Basketball. Archived from the original on May 13, 2007. Retrieved May 1, 2007. ^ "Carmelo Anthony Named One of Three USA World Championship Team Captains". NBA.com. August 17, 2006. Retrieved May 7, 2007. ^ Wojnarowski, Adrian (September 3, 2007). "Team USA's declaration of independence". Yahoo Sports. Archived from the original on February 26, 2013. ^ Helin, Kurt (August 14, 2012). 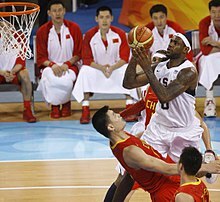 "USA Basketball president lauds LeBron James' maturity". NBC Sports. Retrieved February 26, 2013. ^ "James' record outing highlights Team USA's dominance in title game". ESPN. Associated Press. September 2, 2007. Retrieved September 3, 2007. ^ The Sports Network (August 8, 2008). "LeBron: Now I Understand What It Means to Be an Olympian". The Sports Network. Archived from the original on February 26, 2013. Retrieved February 26, 2013. ^ Morgan, Chris (August 17, 2016). "That One Time They Lost: On the Team USA Men's Basketball Disaster in Athens". Paste. Retrieved February 20, 2018. ^ "United States vs. Spain, August 24, 2008 - Final Round". Basketball Reference. Sports Reference. Retrieved February 20, 2018. ^ "LeBron, Kobe return to U.S. team for London Games". Chicago Tribune. Reuters. July 7, 2012. Retrieved July 8, 2012. ^ "Column: Going out in style – 'K Boys' golden again". ESPN. Associated Press. August 12, 2012. Archived from the original on August 13, 2012. ^ Freeman, Eric (August 13, 2012). "The Team USA Reputations Index: How the gold medal changes our opinions of these players". Yahoo Sports. Archived from the original on August 13, 2012. ^ "LeBron James Tallies First Triple-Double In U.S. Olympic History To Power USA To Semifinals With 119–86 Win Against Australia". USA Basketball. August 8, 2012. Archived from the original on August 14, 2012. ^ a b Stein, Marc (August 12, 2012). "Team USA as good as gold again". ESPN. Retrieved October 14, 2018. ^ Smith, Sekou (August 12, 2012). "U.S. Surges Past Spain Late, Claims Second Straight Olympic Gold Medal". NBA.com. Retrieved August 13, 2012. ^ Deveney, Sean (August 12, 2012). "Olympics 2012: The golden era of LeBron James". Sporting News. Archived from the original on August 13, 2012. ^ Simmons, Bill. "LeBron Makes LeLeap". Grantland. Retrieved June 22, 2012. ^ Windhorst, Brian (November 28, 2018). "LeBron James takes control of the Lakers". ESPN.com. Retrieved November 28, 2018. ^ Davis, Nate (November 17, 2011). "Jalen Rose, Warren Sapp scoff at notion of LeBron in NFL". USA Today. Retrieved June 23, 2012. ^ "Sports Illustrated's Fittest 50". Sports Illustrated. Retrieved August 10, 2014. ^ DuPree, David (April 21, 2006). "King James' next conquest". USA Today. Retrieved August 21, 2006. ^ Windhorst, Brian (September 15, 2017). "LeBron James is still the undefeated champ of #NBArank". ESPN. Retrieved September 15, 2018. ^ "SI's Top 100 NBA Players of 2019: How Long Will LeBron James Remain on Top?". Sports Illustrated. September 13, 2018. Retrieved September 15, 2018. ^ Goldsberry, Kirk. "The 2012-13 CourtVision Awards: The Best Shooters". Grantland. Retrieved November 24, 2013. ^ "2003-04 Cleveland Cavaliers Roster and Stats". Basketball Reference. Sports Reference. ^ "James receives 78 of 118 first-place votes". ESPN. Associated Press. April 21, 2004. Retrieved May 7, 2007. ^ "USA Basketball: LeBron James Bio". USA Basketball. Archived from the original on May 14, 2007. ^ ESPN Staff (January 2018). "LeBron James' path to 30,000 career regular-season points". ESPN. Retrieved September 15, 2018. ^ Taneja, Anil (2009). World of Sports Indoor. Delhi: Gyan Publishing. p. 56. ISBN 978-81-7835-765-2. Retrieved June 13, 2013. ^ a b c Mahoney, Rob. "Then And Now: The Evolution Of LeBron James". Sports Illustrated. Retrieved April 8, 2017. ^ Simmons, Bill. "50 Shades of Westbrook". The Ringer. Retrieved April 8, 2017. ^ Araton, Harvey (March 8, 2011). "With Stars Aplenty, Heat Looks for Leader". The New York Times. p. B11. Archived from the original on March 11, 2011. ^ Zillgitt, Jeff. "LeBron James '50 times better' than in 2007 NBA Finals". USA Today. Retrieved April 8, 2017. ^ Lowe, Zach. "The Miami Juggernaut". Grantland. Retrieved April 21, 2013. ^ Levy, Ian. "What Drives LeBron James' Scoring Efficiency?". Hardwood Paroxysm. Archived from the original on April 9, 2017. Retrieved April 8, 2017. ^ Haberstroh, Tom. "Miami Heat: 2013-14 roster (Subscription required)". ESPN Insider. Retrieved September 20, 2013. ^ Shoals, Bethlehem. "LeBron James Is Underrated and Overlooked". GQ. Retrieved April 9, 2016. ^ Engelmann, Jeremias. "NBA has co-MVPs this season". ESPN Insider. Retrieved April 9, 2016. ^ John Schuhmann [@johnschuhmann] (December 29, 2015). "The worst high-volume shooters from outside the paint, a list topped by LeBron James & Kobe Bryant" (Tweet) – via Twitter. ^ Lowe, Zach. "The Decision 2.0: OK, What's Next?". Grantland. ^ Rosenberg, Michael (May 21, 2012). "Don't hate LeBron, enjoy him; he's most gifted player in NBA history". Sports Illustrated. Retrieved June 7, 2013. ^ Mahoney, Rob. "The Case For: LeBron James as Most Valuable Player". Sports Illustrated. Archived from the original on May 27, 2013. Retrieved June 7, 2013. ^ Windhorst, Brian. "LeBron James' unprecedented season of sharing has arrived". ESPN. Retrieved January 15, 2017. ^ Morre, Matt (March 10, 2012). "Heat 93, Pacers 91: LeBron is clutch, then not clutch, clutch enough?". CBSSports.com. Archived from the original on March 28, 2012. ^ Jackson, Scoop (March 8, 2012). "LeBron's stomach-turning stigma". ESPN.com. Archived from the original on March 28, 2012. ^ Pane, Neil. "LeBron May Be The Most Clutch Playoff Shooter Of His Generation". Retrieved May 22, 2015. ^ "LeBron against the all-time greats". ESPN. Retrieved June 11, 2013. ^ Haberstroh, Tom. "'Point center' LeBron James fourth in DPOY". ESPN. Retrieved June 11, 2013. ^ Lowe, Zach. "Lights, Cameras, Revolution". Grantland. Retrieved June 11, 2013. ^ Harper, Zach. "LeBron James' defensive assignment allows versatility for Miami Heat". CBS Sports. Retrieved June 11, 2013. ^ Haberstroh, Tom. "Who's the real plus-minus MVP?". ESPN Insider. Retrieved June 8, 2014. ^ Partnow, Seth. "Here's proof LeBron James is exiting the prime of his career". The Washington Post. Retrieved August 7, 2016. ^ Duncan, Nate (June 12, 2018). "NBA No-Defense Team: Carmelo Anthony, Enes Kanter and Regular Season LeBron James get the big honors". The Athletic. Retrieved March 5, 2019. His regular-season work has increasingly lagged during his Cleveland years, but even as recently as last season the overall numbers were solid. ^ Pelton, Kevin. "LeBron's 'chill mode' hurting Cavs". ESPN. Retrieved April 8, 2017. ^ Alamar, Ben (April 6, 2018). "It's defense that makes 'Playoff LeBron' a thing". ESPN. Retrieved September 15, 2018. ^ Bilas, Jay (December 17, 2002). "Did 'LeBron Mania' go too far?". ESPN. Retrieved August 6, 2017. ^ Broussard, Chris (October 30, 2003). "James Answers the Hype with Standout Debut". The New York Times. Retrieved August 6, 2017. ^ Smith, Sam (December 12, 2003). "Hype over LeBron doesn't match Alcindor's". ESPN. Retrieved August 6, 2017. ^ Ford, Chad (June 18, 2014). "Top 25 draft prospects since 2000". ESPN Insider. ESPN. Retrieved August 6, 2017. ^ "NBA Rookie of the Year Award Winners". NBA.com. Retrieved October 14, 2018. ^ Youngmisuk, Ohm (May 24, 2018). "It's unanimous: LeBron James, James Harden voted All-NBA; it's the 12th time for LeBron". ESPN. Retrieved October 14, 2018. ^ "LeBron takes 2013 Kia Most Valuable Player award". NBA.com. May 5, 2013. Retrieved May 5, 2013. ^ "NBA Finals MVP Award Winners". NBA.com. Retrieved October 14, 2018. ^ Wallace, Michael (May 5, 2013). "LeBron James wins 4th MVP award". ESPN. Archived from the original on May 6, 2013. ^ Paine, Neil (June 1, 2015). "Where This Year's Cavs Rank Among LeBron's NBA Finals Supporting Casts". FiveThirtyEight. Retrieved August 7, 2016. ^ Haberstroh, Tom (June 2, 2016). "LeBron's 2-4 Finals record is one of his greatest achievements". ESPN. Retrieved August 7, 2016. ^ Lowe, Zach (June 2, 2016). "The Rematch: An NBA Finals preview". ESPN. Retrieved August 7, 2016. ^ McCullum, Jack (February 8, 2016). "SI's 50 greatest players in NBA history". Sports Illustrated. Retrieved October 14, 2018. ^ "All-Time #NBArank: Counting down the greatest players ever". ESPN. March 3, 2016. Retrieved May 27, 2017. ^ CBS Sports Staff (February 17, 2017). "CBS Sports' 50 greatest NBA players of all time: Where do LeBron, Curry rank?". CBS Sports. Retrieved February 18, 2017. ^ Lynch, Andrew (December 25, 2017). "Ranking the 25 greatest players in NBA history". Fox Sports. Retrieved October 14, 2018. ^ "Top 100: The Greatest Players of All Time". Slam. United States: Page, Dennis S. February 23, 2018. ^ Ryan, Bob (May 13, 2017). "Who's the GOAT, Michael or LeBron?". The Boston Globe. Retrieved May 15, 2017. ^ The Ringer Staff (February 19, 2018). "Jordan-LeBron Week". The Ringer. Retrieved October 14, 2018. ^ Neuharth-Keusch, AJ (June 9, 2018). "Steve Kerr: Michael Jordan and LeBron James 'two best players that I've ever witnessed'". USA Today. Retrieved October 14, 2018. ^ Windhorst, Brian (February 10, 2016). "All-Time #NBArank: LeBron No. 3". ESPN. Retrieved October 14, 2018. ^ Amato, Laura. "LeBron James' Kids: 5 Fast Facts You Need to Know". Heavy.com. Retrieved October 7, 2015. ^ CNN Library. "LeBron James Fast Facts". CNN. Retrieved August 18, 2014. ^ Wire Reports (January 1, 2012). "LeBron James and Savannah Brinson are engaged". Los Angeles Times. Retrieved January 2, 2012. ^ "LEBRON WEDS GIRLFRIEND IN SAN DIEGO". Associated Press. Retrieved September 15, 2013. ^ Carter, Nicole (December 9, 2010). "Miami heat: LeBron James buys $9M mansion in Coconut Grove, Fla". New York: NY Daily News. Retrieved July 4, 2012. ^ "LeBron James Snags Brentwood Mansion for $21 Million". Variety. November 10, 2015. ^ Vardon, Joe. "LeBron James is the 'face' of the NBA, but is Stephen Curry next?". Cleveland.com. Retrieved February 16, 2015. ^ Feldman, Dan. "LeBron James reportedly asked Adam Silver for longer All-Star break, fewer back-to-backs". NBC Sports. Retrieved February 16, 2015. ^ Pollakoff, Brett. "Report: LeBron James elected Vice President of NBA Players Association". NBC Sports. Retrieved February 16, 2015. ^ a b "Some Call LeBron James' 'Vogue' Cover Offensive". National Public Radio. March 27, 2008. ^ a b Hill, Jemele (March 21, 2008). "LeBron should be more careful with his image". ESPN.com. Retrieved October 13, 2010. But this cover gave you the double-bonus of having LeBron and Gisele strike poses that others in the blogosphere have noted draw a striking resemblance to the racially charged image of King Kong enveloping his very fair-skinned lady love interest. ^ "The Most Influential Athletes". Forbes. April 21, 2010. ^ Van Riper, Tom. "Most Influential Athletes 2013". Forbes. Retrieved July 27, 2013. ^ Dove, Rita. "LeBron James: Time 100". Time. Retrieved May 21, 2017. ^ Cho, Janet. "Sherwin-Williams replaces LeBron poster with Cleveland skyline". Cleveland.com. Retrieved July 1, 2012. ^ Briggs, David (October 5, 2007). "LeBron spurns Tribe, sports Yanks cap". MLB.com. ^ America's Most Disliked Athletes. Forbes; February 7, 2012. ^ Rovell, Darren. "LeBron James NBA's most popular". ESPN. Retrieved July 27, 2013. ^ Harper, Zach. "LeBron James is finally the most popular male athlete in America". CBS Sports. Retrieved July 25, 2014. ^ Rovell, Darren. "LeBron James tops jersey sale". ESPN. Retrieved April 27, 2014. ^ Chronicle News Services. "NBA: LeBron becomes third man on Vogue cover". Houston Chronicle. Retrieved February 26, 2013. ^ "LeBron James – Forbes". Forbes. Retrieved June 9, 2013. ^ Windhost, Brian (September 13, 2012). "LeBron chooses Rich Paul as agent". ESPN.com. Archived from the original on September 7, 2014. ^ Freeman, Eric (September 13, 2012). "On LeBron James' bold move to leave CAA, and the league-wide implications that could result". yahoo.com. Archived from the original on September 7, 2014. ^ Taddeo, Lisa (July 6, 2010). "LeBron James's Magnum-sized, Ultrashiny, Nike-powered Lawn Mower to the Next Century". Esquire. Archived from the original on September 7, 2014. ^ Windhorst, Brian. "LeBron James transitioning from businessman to a business, man". ESPN. Retrieved May 8, 2016. ^ Winderman,, Ira (July 8, 2010). "Sun Sentinel: LeBron James to join Chris Bosh, Heat's Dwyane Wade". SunSentinel. Retrieved July 7, 2013. ^ "LeBron officially signs contract extension with Cavs". ESPN.com. Retrieved May 7, 2007. ^ Megdal, Howard. "LeBron James, decisions, and how Carmelo Anthony squandered all his leverage". CBS Sports. Retrieved February 20, 2017. ^ "LeBron James Opts Out of Contract". International Business Times. Retrieved June 29, 2015. ^ "Cavaliers Re-sign Forward LeBron James". NBA.com. July 10, 2015. Retrieved July 11, 2015. ^ Sam, Amick. "LeBron James gets two-year contract with Cavaliers". USA Today. Retrieved May 8, 2016. ^ "Cavaliers And LeBron James Sign Multi-Year Contract". NBA.com. August 12, 2016. Retrieved August 12, 2016. ^ Bradley, Pat. "NBA Scoreboard Stats Standings Teams Players Odds LeBron James Just Became NBA's Highest-Paid Player For First Time Ever". NESN. Retrieved September 2, 2016. ^ Adams, Ariel. "You Can Now Buy The $51,500 LeBron James Limited Edition Watch By Audemars Piguet". Forbes. Retrieved May 27, 2017. ^ a b Highkin, Sean. "Magic Johnson thinks LeBron doesn't have enough endorsements". USA Today. Retrieved June 9, 2013. ^ "Dunkin' aims at China with pork donuts, LeBron James". Reuters. March 5, 2012. Retrieved June 5, 2012. ^ "James to endorse for McDonald's". ESPN.com. Associated Press. Retrieved July 4, 2012. ^ "LeBron James enters partnership with State Farm". USA Today. February 13, 2008. Retrieved October 27, 2009. ^ "Beats by Dre signs UFC star Conor McGregor to endorsement deal as it moves deeper into popular culture". The Drum. Retrieved December 25, 2017. ^ Rovell, Darren. "LeBron James Signs New Deal With Nike". CNBC. Retrieved June 9, 2013. ^ Berman, John. "Is LeBron James Worth $90 Million?". ABC News. Retrieved June 9, 2013. ^ Eagle, Ben. "LeBron James reportedly leads all NBA players in U.S. shoe sales". Sports Illustrated. Archived from the original on June 9, 2013. Retrieved June 9, 2013. ^ Futterman, Matthew (April 6, 2011). "LeBron James in Deal With Fenway Sports". The Wall Street Journal. Retrieved April 6, 2011. ^ "10 famous Liverpool fans from North America". Liverpool F.C. April 12, 2014. Retrieved November 20, 2015. ^ Badenhausen, Kurt. "Full List: The World's 50 Highest-Paid Athletes". Forbes. Retrieved July 2, 2012. ^ Golliver, Ben. "LeBron James passes Kobe Bryant on SI's 'Fortunate 50' highest-earning athletes list". Sports Illustrated. Archived from the original on June 7, 2013. Retrieved May 26, 2013. ^ Windhorst, Brian. "Heat look to target Carmelo Anthony". ESPN. Retrieved June 21, 2014. ^ "The World's Highest Paid Athletes List 2016". Forbes. June 15, 2016. ^ "LeBron James: "My Dream Is To Actually Own An NBA Team"". ^ ESPN.com news services. "LeBron, Kimmel to co-host ESPY Awards". ESPN.com. Retrieved February 26, 2013. ^ "SNL Transcripts: LeBron James". SNL Transcripts. Retrieved February 26, 2013. ^ "Lebron James Matt Damon "Entourage" Cameo October 4". Pop Crunch. Retrieved July 2, 2012. ^ Smith, Troy L. "LeBron James filming 'Trainwreck' with Amy Schumer and other movie projects". Cleveland.com. Retrieved August 31, 2014. ^ "The Greatest Movie Performance by an Active Professional Basketball Player". The New Yorker. July 20, 2015. Retrieved July 21, 2015. ^ "LeBron James's confessional video web site for athletes gets investment from Turner and Warner Bros". Mashable. Retrieved December 3, 2015. ^ "LeBron James' SpringHill Entertainment Signs Deal With Warner Bros". The Hollywood Reporter. July 22, 2015. Retrieved May 16, 2016. ^ Levin, Josh. "Self-Love and Basketball". Slate. Retrieved February 26, 2013. ^ Peter, Josh (October 17, 2018). "Can LeBron James win on and off the court in Los Angeles?" USA Today. Retrieved January 9, 2019. ^ Windhorst, Brian (February 10, 2015). "Disney XD picks up 'Becoming'". ESPN. Retrieved May 16, 2016. ^ "King of Comedy: Trailer for LeBron's new sitcom released". Fox Sports. Retrieved August 31, 2014. ^ "The LeBrons: Season 2 Kickoff Party with LeBron James". Houston Press. February 18, 2013. Retrieved May 16, 2016. ^ "LeBron James' reality TV show 'Cleveland Hustles' to premiere Aug. 24". Crain's Cleveland Business. April 1, 2016. Retrieved May 16, 2016. ^ ""The Carter Effect" Trailer". cowbellkingdom.com. Retrieved August 24, 2017. ^ "Look: LeBron, business partner dine with Drake". theScore.com. Retrieved August 24, 2017. ^ "LeBron James' production company to remake 1990 hit 'House Party'". ABC.com. Retrieved February 13, 2017. ^ Sullivan, Emily (February 19, 2018). "Laura Ingraham Told LeBron James To Shut Up And Dribble; He Went To The Hoop." NPR.org. Retrieved January 8, 2019. ^ "LeBron doc 'Shut Up and Dribble' set to air on TV". ESPN.com. Retrieved August 7, 2018. ^ "LeBron James Charity Work, Events and Causes". Look to the Stars. Retrieved July 1, 2012. ^ "LeBron James Just Delivered Nikes He Helped Design for Kids With Disabilities". Global Citizen. Retrieved December 25, 2017. ^ EnStars (December 17, 2015). "Inspiring Videos: Cleveland Cavaliers Star LeBron James Pays Respect To A Fan In The Middle Of A Game". Enstarz. Retrieved December 25, 2017. ^ "The LeBron James Family Foundation to Unveil its Brand New Website, LeBronJamesFamilyFoundation.org". NBA.com. Retrieved July 1, 2012. ^ "LeBron's bike event stresses education". ESPN.com. Associated Press. Retrieved July 1, 2012. ^ ESPN.com news services. "LeBron James, Akron to fund 4-year scholarships for I Promise students". ESPN. Retrieved October 3, 2015. ^ "LeBron James donates $2.5 million to Smithsonian's Muhammad Ali exhibit". ESPN.com. November 17, 2016. Retrieved November 17, 2016. ^ "LeBron James Wins PBWA's 2016-17 J. Walter Kennedy Citizenship Award". Cleveland Cavaliers Official Website. Retrieved May 21, 2017. ^ Associated Press (November 28, 2017). "Board OKs plan for LeBron James' 'I Promise' school in Akron." USA Today. Retrieved January 8, 2019. ^ Singer, Michael. "LeBron James: Opening school is my most important professional accomplishment". USA Today. Retrieved August 8, 2018. ^ a b Wallace, Michael. "LeBron: No place for Sterling". ESPN. Retrieved April 27, 2014. ^ "James Draws Criticism For Stand on Darfur Issue". Yahoo. May 28, 2007. ^ Beck, Howard (May 16, 2007). "Cavalier Seeks Players' Support for Darfur". The New York Times. Retrieved June 8, 2007. ^ Zimmerman, Jonathan. "On Darfur, LeBron James drops the ball". Christian Science Monitor. Retrieved June 7, 2007. ^ Smith, Shelley (May 16, 2008). "LeBron speaking out on Darfur". ESPN. ^ Hill, Jemele. "The Heat's hoodies as change agent". ESPN. Retrieved April 27, 2014. ^ McMenamin, Dave. "LeBron James: Bigger issues at play". ESPN. Retrieved December 11, 2014. ^ McMenamin, Dave. "LeBron, Irving in 'I Can't Breathe' tees". ESPN. Retrieved December 11, 2014. ^ Ward-Henninger, Colin. "Cavs' LeBron James responds to racist graffiti on house with powerful statement". CBS Sports. Retrieved August 8, 2018. ^ Tsuji, Alysha. "LeBron James saddened by Charlottesville: 'Make America Great Again huh?!'". For The Win. USA Today. Retrieved August 8, 2018. ^ Bonesteel, Matt; Marissa Payne. "LeBron James sticks up for Stephen Curry, calls President Trump a 'bum'". The Washington Post. Retrieved August 8, 2018. ^ Gaydos, Ryan. "LeBron: Trump is using sports to 'divide' the country". New York Post. Retrieved August 8, 2018. ^ Lieu, Amy. "Trump tweet slams LeBron James, Don Lemon over CNN interview". Fox News. Retrieved August 8, 2018. ^ McMenamin, Dave. "LeBron James feels that Colin Kaepernick is being blackballed by NFL". ESPN. Retrieved November 20, 2017. ^ Thanawalla, Ali. "LeBron James shows support for Colin Kaepernick before Lakers-Kings game". NBC Sports. Retrieved October 4, 2018. ^ Folley, Aris. "LeBron James, Kevin Durant sport jerseys in support of Kaepernick for Super Bowl weekend". The Hill. Retrieved February 2, 2019. ^ "Lebron donates cash to Obama". InsideHoops.com. July 31, 2008. Archived from the original on May 22, 2011. Retrieved May 7, 2013. ^ a b "Jay-Z, LeBron James get out vote for Obama". msnbc. October 30, 2008. ^ Rooney, Kyle (November 8, 2016). "Lebron James lets fans know Love, genuine LOVE and FAITH they'll get through". Hotnewhiphop. Retrieved November 8, 2016. ^ Siddiqui, Sabrina (November 6, 2016). "LeBron James praises 'President Hillary Clinton' at Cleveland rally". The Guardian. Retrieved March 22, 2019. ^ "LeBron James". USA Basketball Official Website. Retrieved June 22, 2013. ^ "Andrew Wiggins Named Naismith Player of the Year; Quincy Lewis Named Coach of the Year". SLAM Online. Retrieved July 4, 2013. ^ Grimala, Michael. "Shabazz Muhammad is McDonald's POY". ESPN. Retrieved July 4, 2013. ^ "McDonald's High School Basketball All American Teams". Basketball Reference. Sports Reference. Retrieved July 4, 2013. ^ a b "Cleveland Cavaliers choose LeBron James with No. 1 pick in 2003: NBA Draft rewind". Cleveland.com. Retrieved July 4, 2013. ^ "James' Number Retired". Associated Press via cincinnati.com. Retrieved February 20, 2003. ^ "LeBron James Arena". St. Vincent-St. Mary High School. Archived from the original on April 28, 2015. Retrieved April 25, 2015. ^ "LeBron James Arena". St. Vincent St. Mary. Archived from the original on July 6, 2016. Retrieved June 26, 2016. ^ "Finalists & Past Winners". Cleveland Sports Awards. Retrieved January 28, 2016. ^ Negley, Cassandra (December 27, 2018). "LeBron James selected AP Male Athlete of 2018 after 'most significant' year". Yahoo Sports. Retrieved January 21, 2019. ^ Jenkins, Lee (December 3, 2012). "Miami Heat's LeBron James named SI's Sportsman of the Year". Sports Illustrated. Retrieved July 19, 2013. ^ "Sporting News Athlete of the Year 2012". Sporting News. Retrieved July 19, 2013. ^ "James, Nash share Sporting News MVP award". ESPN. Retrieved June 22, 2013. ^ "NBA & ABA Sporting News Rookie of the Year Award Winners". Basketball Reference. Sports Reference. Retrieved June 22, 2013. ^ "The NBA All-Decade Team". Sports Illustrated. December 15, 2009. Retrieved July 19, 2013. ^ "2016 ESPY Awards". ESPN. Retrieved July 14, 2016. ^ a b "Akron designates downtown street "King James Way"". Akron Beacon Journal. Archived from the original on June 24, 2016. Retrieved June 23, 2016. ^ "LeBron James has honorary locker at OSU". Fox Sports. Retrieved September 3, 2013. ^ "LeBron James has football locker at OSU". Cavaliers 24/7. Retrieved August 16, 2016. ^ Zillgitt, Jeff (June 30, 2018). "LeBron James' show 'Survivor's Remorse' begins second season". usatoday.com. Retrieved June 30, 2018. Freedman, Lew (2008). LeBron James: A Biography. Westport, CT: Greenwood Press. ISBN 978-0-313-34361-2. Morgan, David Lee (2003). LeBron James: The Rise of a Star. Cleveland: Gray & Co. ISBN 978-1-886228-74-0. Pluto, Terry; Windhorst, Brian (2007). The Franchise: Lebron James and the Remaking of the Cleveland Cavaliers. Cleveland: Gray & Co. ISBN 978-1-59851-028-7. "LeBron James collected news and commentary". The New York Times.